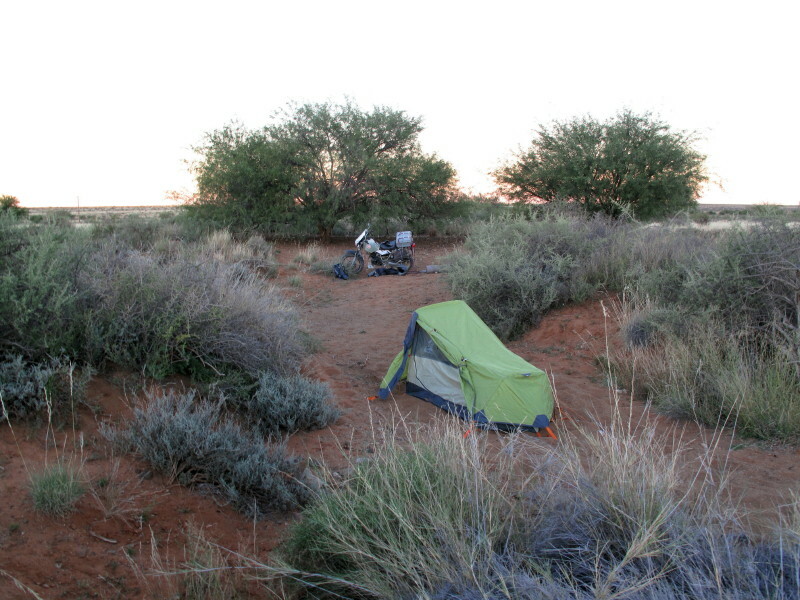 Trailrider invited me to join him and Letsgofishing on a ride of the Burchell Route. Ride report *here*. This is a picture from that report. When I came to write up my part of the report I did a little research on Burchell. 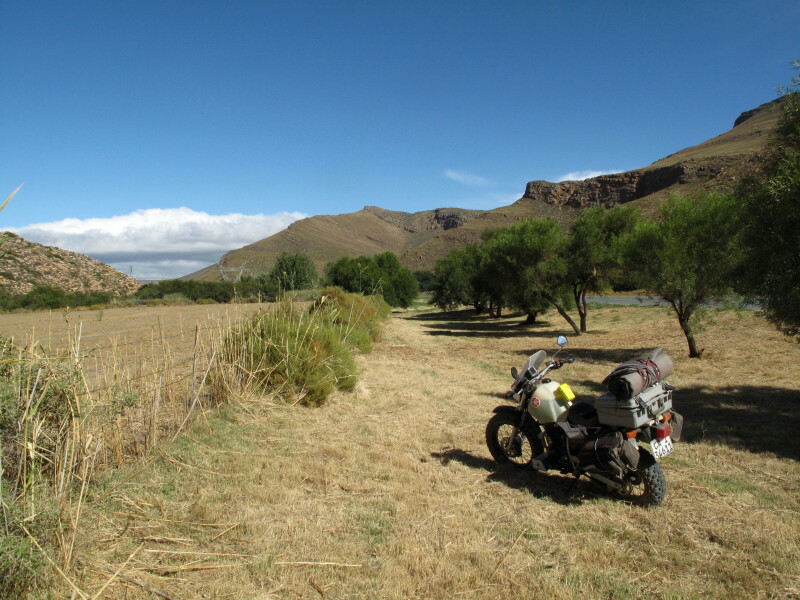 I found he had done a big trip of over 7 000 km across the Great Karoo almost to the present Botswana border, down to Graaff-Reinet, Grahamstown and Port Beaufort before returning to Cape Town on the coastal route. It was on that return journey that he did what is now the Burchell Route. 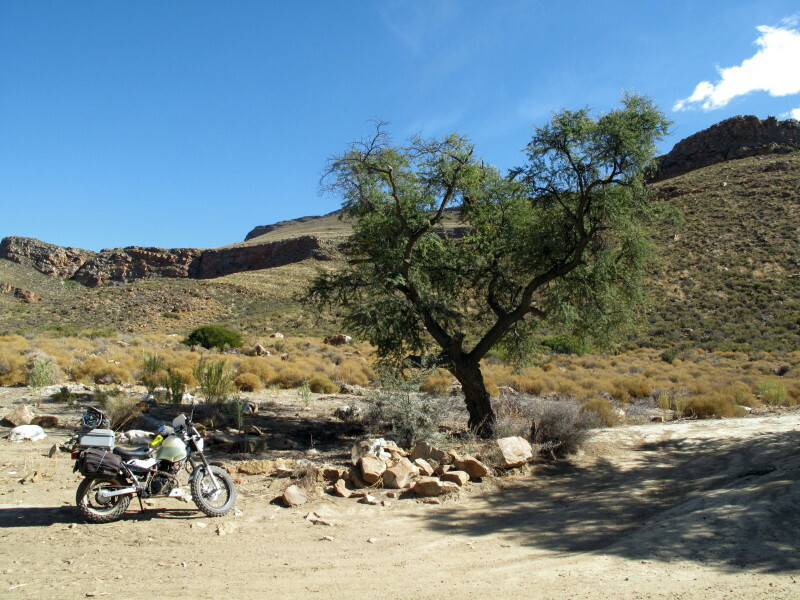 I like riding in the Karoo so became interested in following his trek. I had learned that he had written a two volume account of the outward leg of his travels and that they had been reprinted in 1953 & 1967 (only 1000 copies in ’67; fewer in ’53 no doubt). They included a large scale map of his route. I found a copy in a book collectors shop and bought it (making sure the map was included). The map shows the route but it is difficult to translate into current terms since once past present day Fraserburg it was pretty well unexplored country. 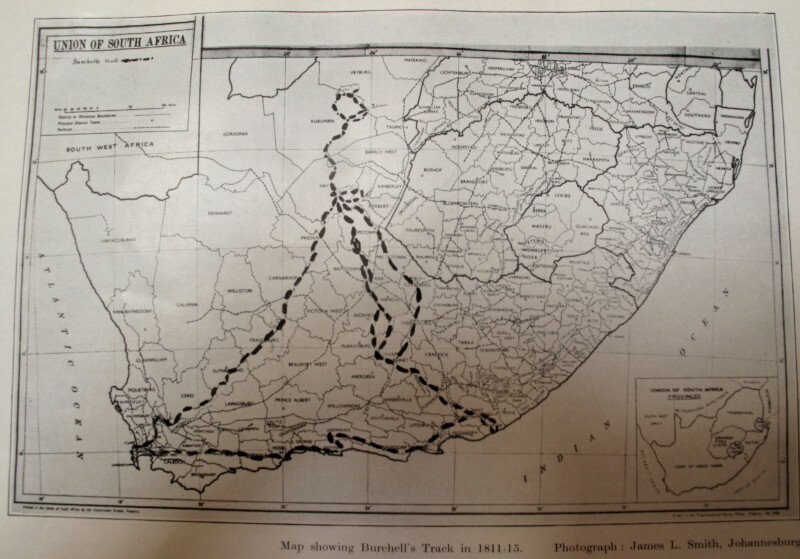 However there was a good introduction in the reprint from which I learned that Helen McKay had published Sketch Map of Burchell’sTrek in South African Journal of Science in 1943 and had written a four part series about him in Journal of South African Botany in 1941. I went to the S.A. Library to read that stuff. 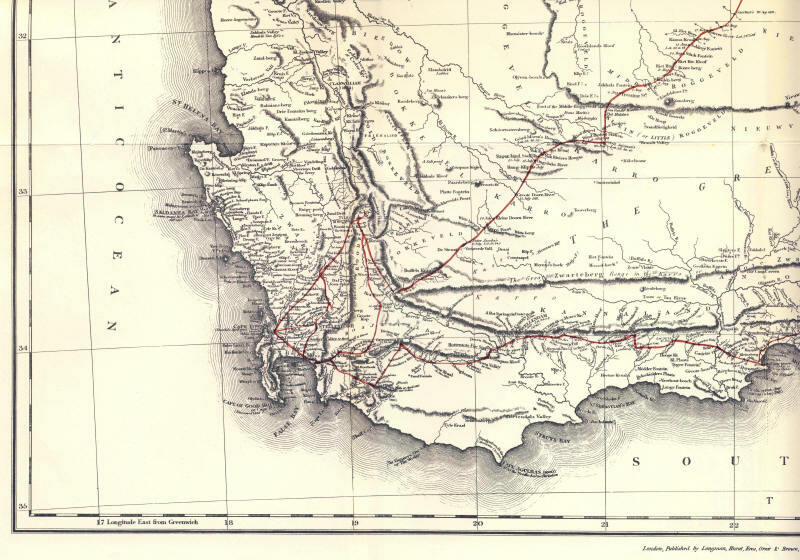 The Sketch Maps were excellent as they showed his route superimposed on a then current map of South Africa so I had not only the town names but also the major roads shown. Fortunately I had taken my camera along so proceeded to photo the 10 maps together with the register of each days travel (not using flash). I had almost completed the pictures when an official noticed me & said it is not permissible to photo in there (apparently you can get photostats at considerable expense & quite a delay). No matter; I had what I needed. This is a picture of his entire trek. He went up through the Great Karoo to what is now Griekwastad (Klaarwater mission then) Did a hippo hunting trip to Douglas (east) then a long trek down to Graaff-Reinet on horseback to recruit staff for the rest of his trip. 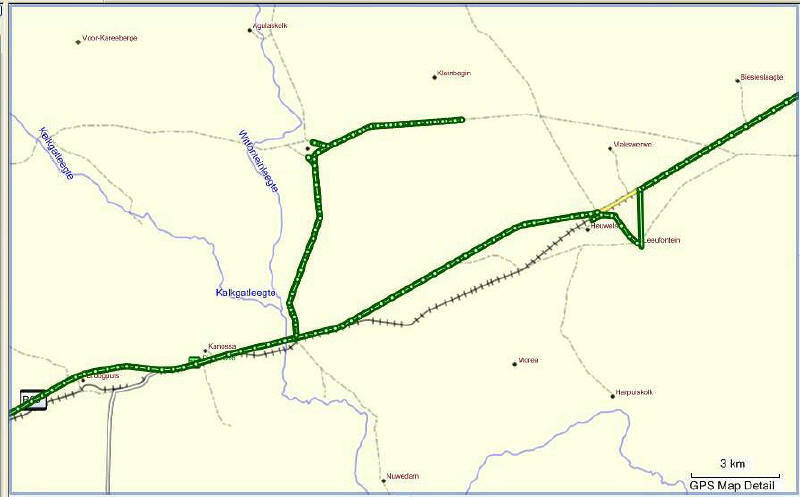 A loop north of Griekwastad where he spent some time at Litakun (now Dithakong) which was the ‘capital’ for the local Tswana. Then he went on what I call the giraffe trip up to Heuningvlei and down to Kathu (Sishen) and back to Griekwastad. 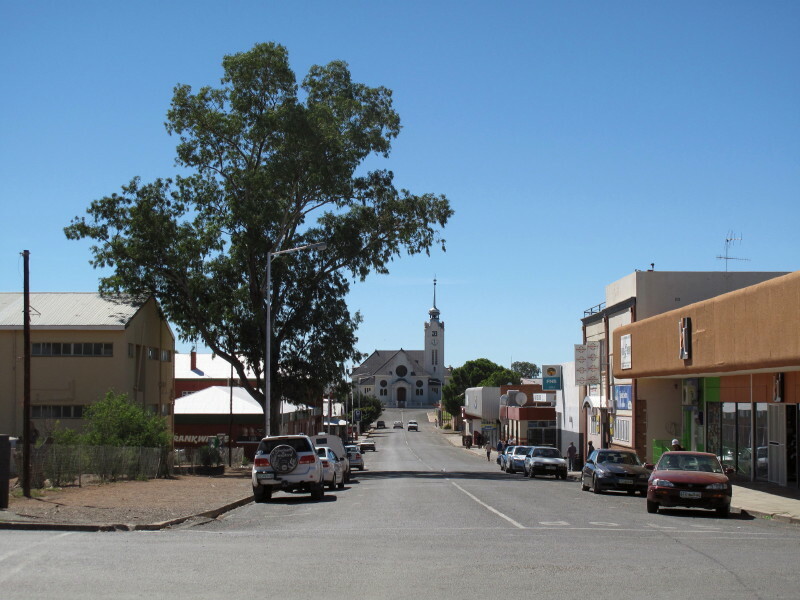 From there he went down to Graaff-Reinet again but by wagon this time. Down to Grahamstown (not there then: area called Albany) and Port Beaufort. Then back to Cape Town through Uitenhage, Port Elizabeth, Langkloof, Plettenburg Bay and George. That took him from June 1811 to February 1815; he was not travelling all the time as he stayed in Griekwastad and Litakun for extended periods. I read the two volumes. They are quite big (you can now download pdf versions from Google but that does not include the big map nor the valuable introduction that alerted me to McKay’s useful work). Burchell was a naturalist who collected over 50 000 specimens; largely plants as that was his main interest but also insects, birds and animal skins. A large part of his writing is notes about the plants etc. In 1935 Prof Notcutt extracted the bits about the actual travels and published them as an English Reader for South African children. I got to see that at the S.A.Library and was amazed to find it is a book as small as a A5 week at an opening diary (though the writing is quite a bit smaller than in the original book). 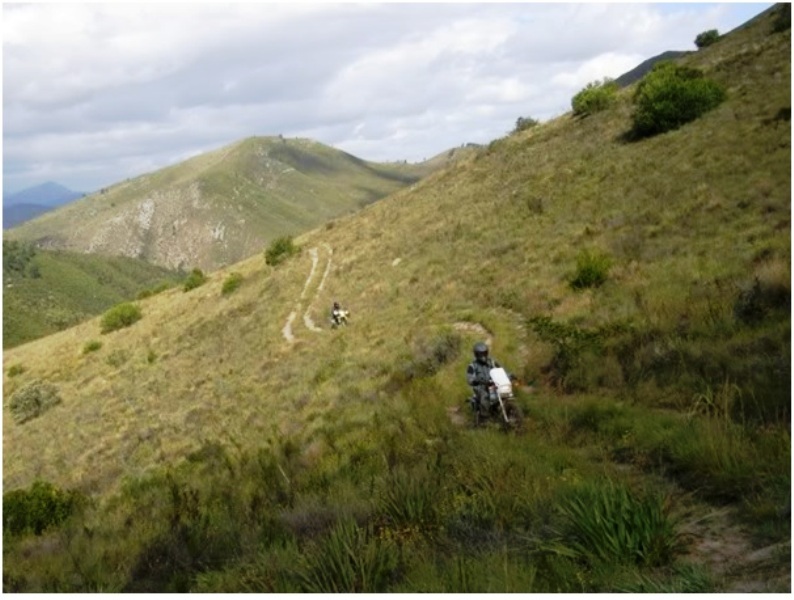 I retraced the trek (but excluded the horseback trip to Graaff-Reinet and back) fairly closely on my TW200. It took me 16 days riding 5 700km. Burchell includes many woodcut engravings and some large colour plates in his book. I wanted to photo what those same things look like today. 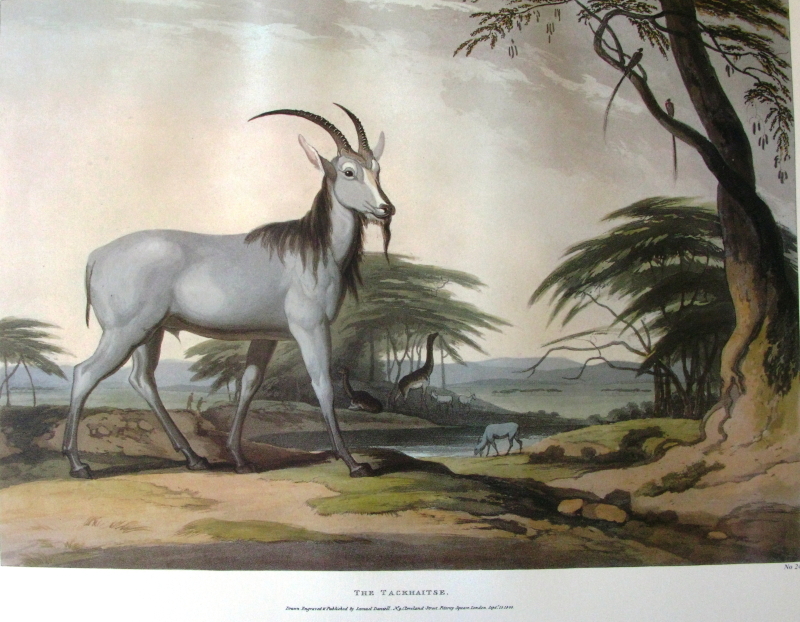 We also have a copy of Daniell’s African Scenery and Animals which includes pictures of Litakun (Daniell was there just ten years before Burchell) so I decided to have a sub theme of replicating his pictures also. We also have the books of Schumacher & Le Valliant’s with pictures of various parts of the route from the same era so I added them to my list. A side plot for the ride. 1. A brief report of my ride each day. 2. A report on Burchell’s trek for the same bit. 3. Copies of the pictures with my photos of the same view. 4. Some discussion on topics that arise which interested me. It is very long so I am now writing a report divided into the major geographical regions with little about my ride, something about Burchell and the pictures with my equivalents and commentary about them. There were things that I came across that interested me but have nothing to do with Burchell which I have chosen to include. adventurer, artist, author,naturalist, botanist, musician, draughtsman, cartographer, navigator, linguist. EDIT 2017/02/11. This thread must be given as a link somewhere as it continues to get hits as it had 1800 hits in August 2014 but it had 8260 in January 2017. I added it as an external link to the Wikipedia entry for Burchell when I posted it back in 2010 but the surge is unlikely to be due to that. In 2014 a bust of Burchell was erected in the botanical gardens in George to mark the bicentenary of Burchell so that stimulated some interest in him. But the majority of those hits have been in the years since then. Because of this interest I am going to add the GPS tracks of my ride. They may be of use to anyone wanting to retrace or research Burchell's trip. I am going to add them all here rather than spread them through the report on the relevant pages. I am limited to 10 per post so there are more on the next post. It covers his whole life, providing interesting information about the times before and after his time in South Africa. To me the book was a bit academic and dry – I would have liked it to have been dramatized more. This is the escarpment up to Sutherland. Notice the latitude recorded at the kink in the track. Marked are the Doorn (Doring) and Tankwa rivers. 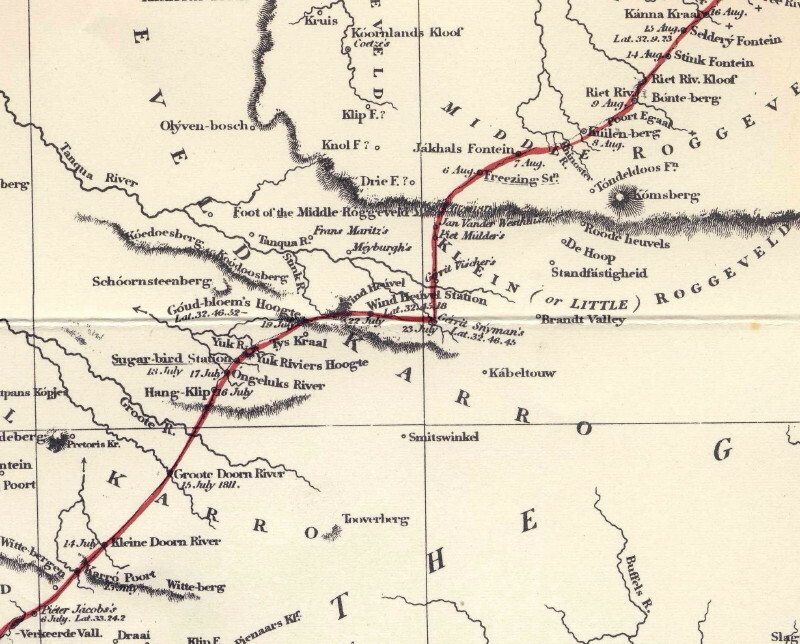 On the 1:250 000 map #3220 Windheuwel, Yak River (Juksfontein), Komsberg (Komsbergpas) and Jakalsfontein are all shown. As to the miserable thing called a map, which has been prefixed to Mr. Barrow’s quarto, I perfectly agree with Professor Lichtenstein, that it is so defective that it can seldom be found of any use. I believe this spat contributed greatly to the non appearance of the intended third volume of Burchell’s Travels. 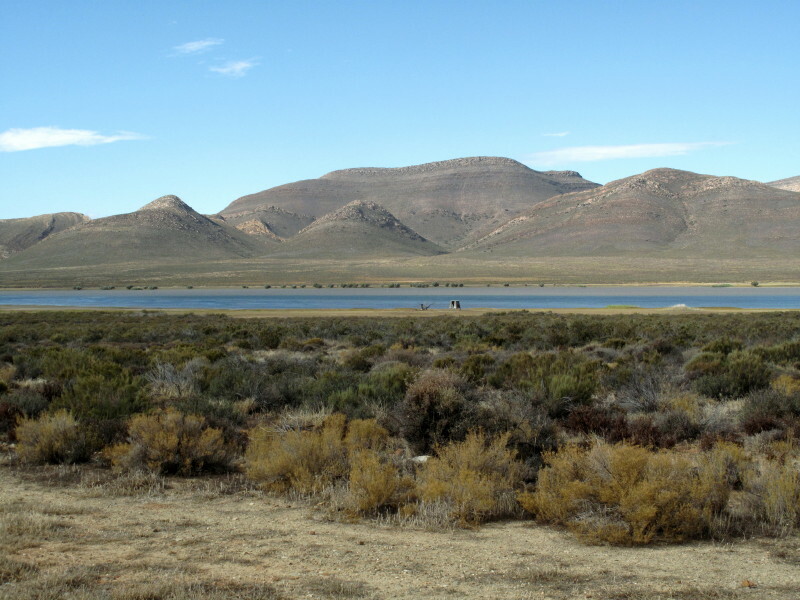 We have been denied his account of the trek from Litakun up to Heuningvlei, down to Graaff-Reinet , the mouth of the Fish River & back to Cape Town as a consequence. 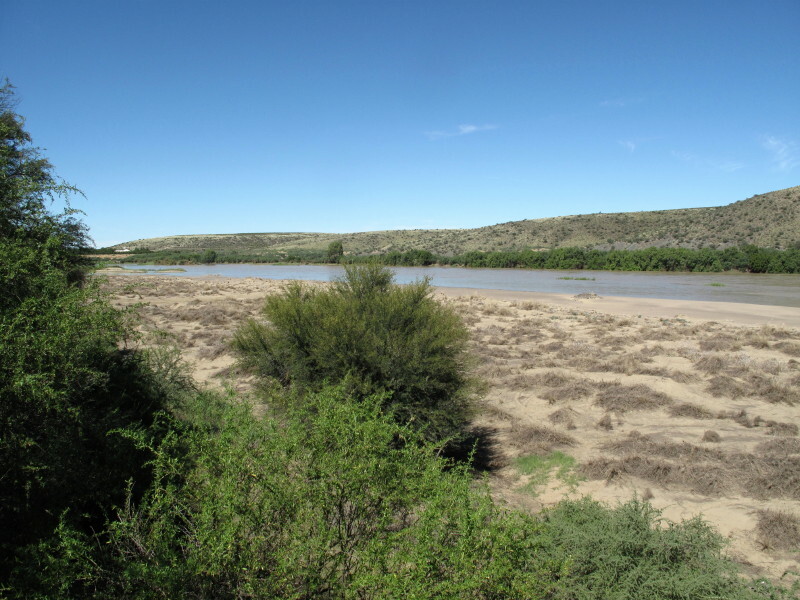 Burchell’s picture of the pont over the Berg river. 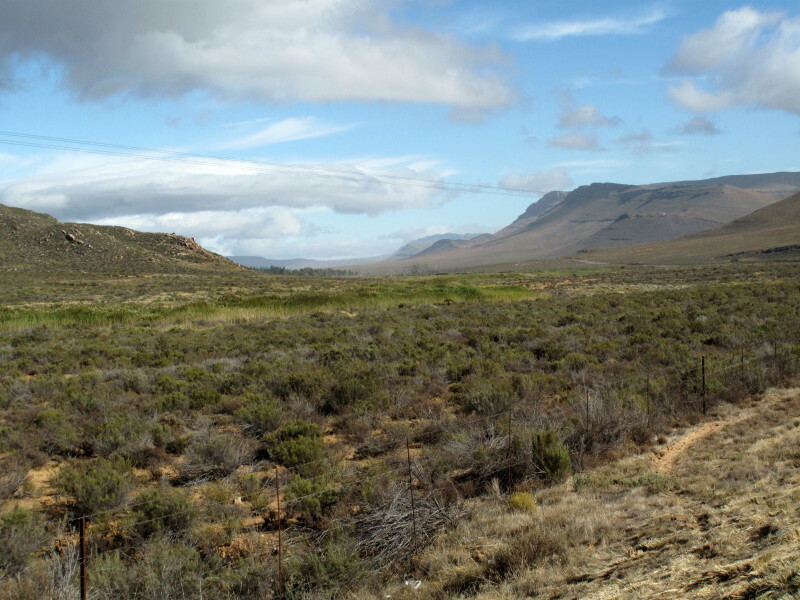 On the map he lists it as Burger’s Drift very close to the Paardeberg. 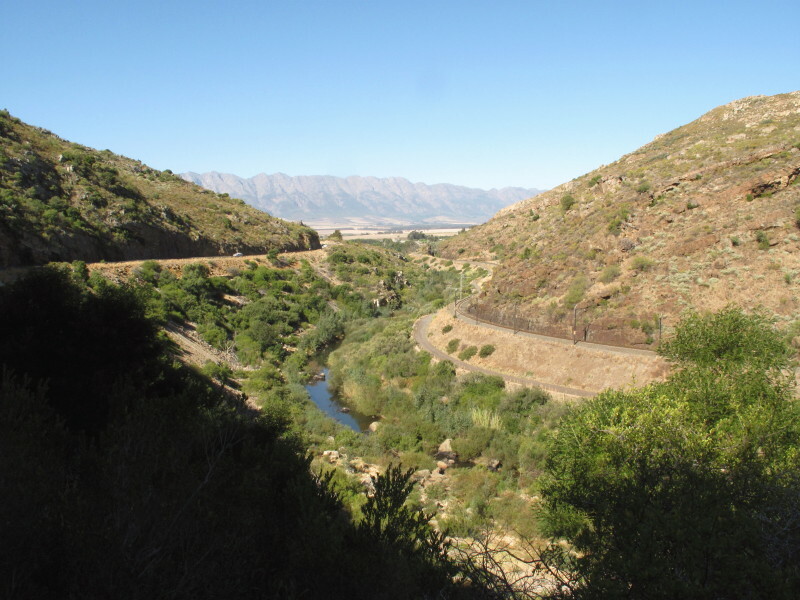 I crossed the Berg river at Zonquasdrift on the gravel road from Riebeek-Kasteel downstream from Hermon. 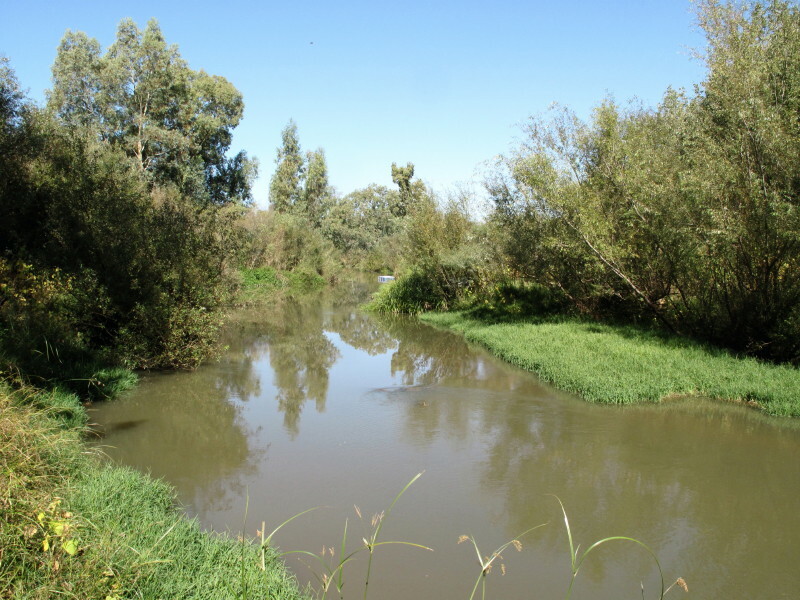 It is a bit downstream from where Burchell shows his crossing. I will go & see if I can match the skyline in the picture some day. Where I crossed there are lots of trees but none of them are indigenous. I want to include pictures of what the terrain looks like now. 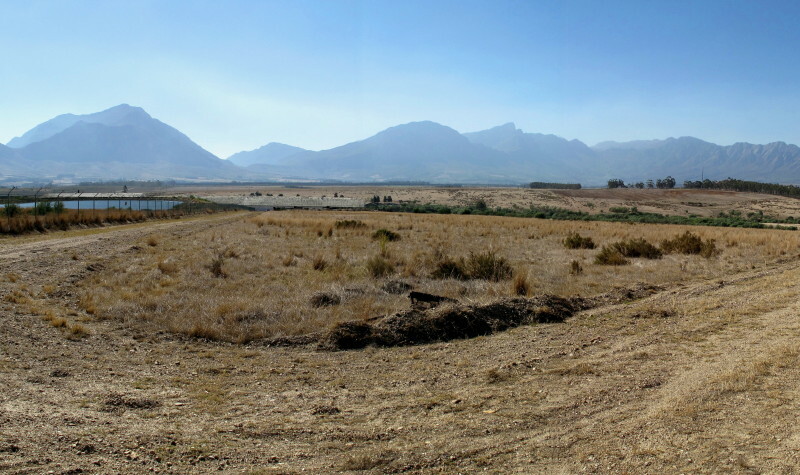 Here is the plain of the Berg River with Groot Winterhoek on the left and the Witzenberg as the line of mountains in the background. This is the first barrier on the route. 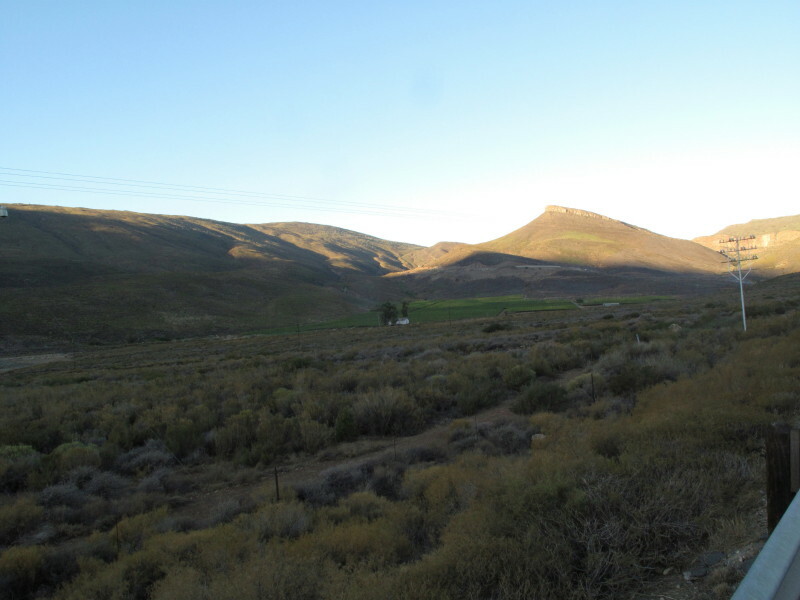 Nuwekloof, where they went through, is at the lowest point of the foreground hills. The mountains behind were a really serious barrier but there used to be a wagon route over it (Witzenberg Pass) but there is no road across them there today. EDIT 2017/02/10 The rest of the GPS tracks. 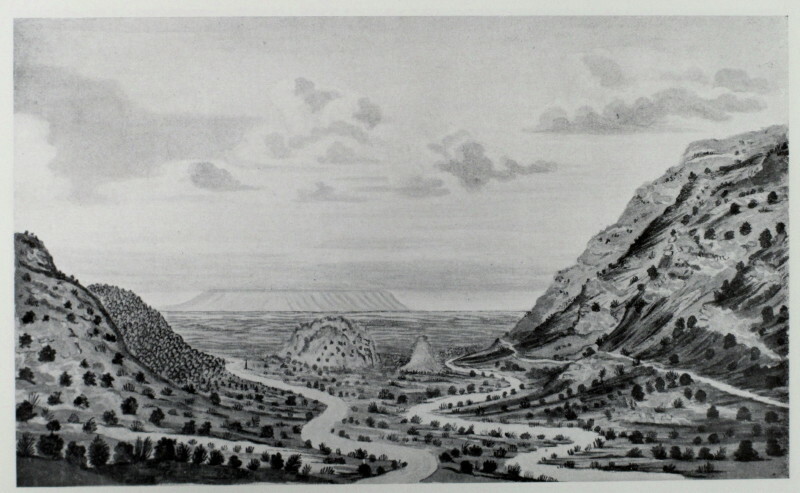 Burchells vignette of Nuwekloof which he called Roodezand’s Kloof. 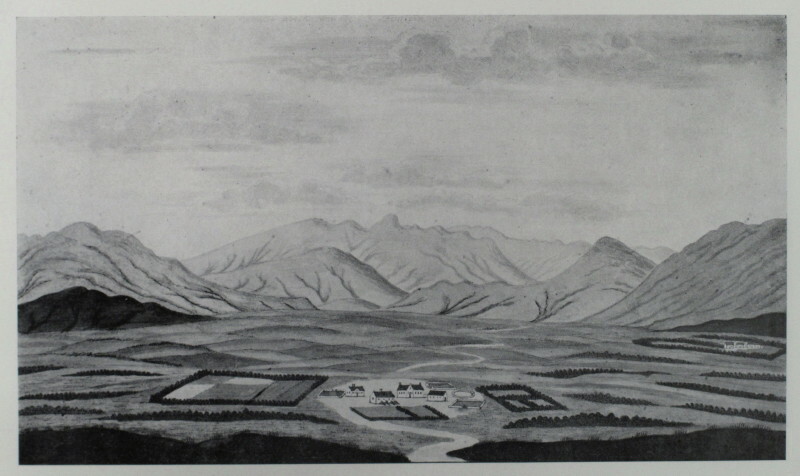 Roodezand was the original name for the Tulbagh valley. My picture of the same place. It is interesting that the road was on the northern bank when Burchell went through (as it is today) because the photo shows the old road just below the railway line on the opposite bank. 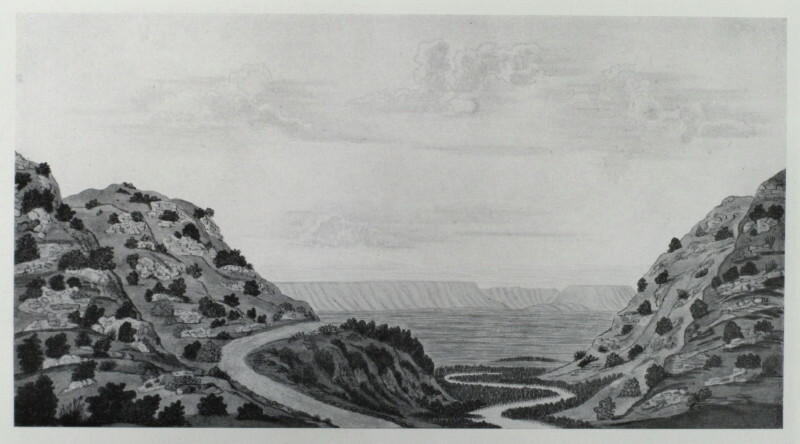 The original route was opened in about 1760 as shown in the Buchell engraving. One hundred years later Thomas Bain built a new road on the opposite bank – the one below the railway line in my photo. Bain built the railway line 15 years later. Another 100 years and the present road was built in 1968 reverting to the same side as the original road. I have tried to get onto the Bain road but have not found an entrance from either end. 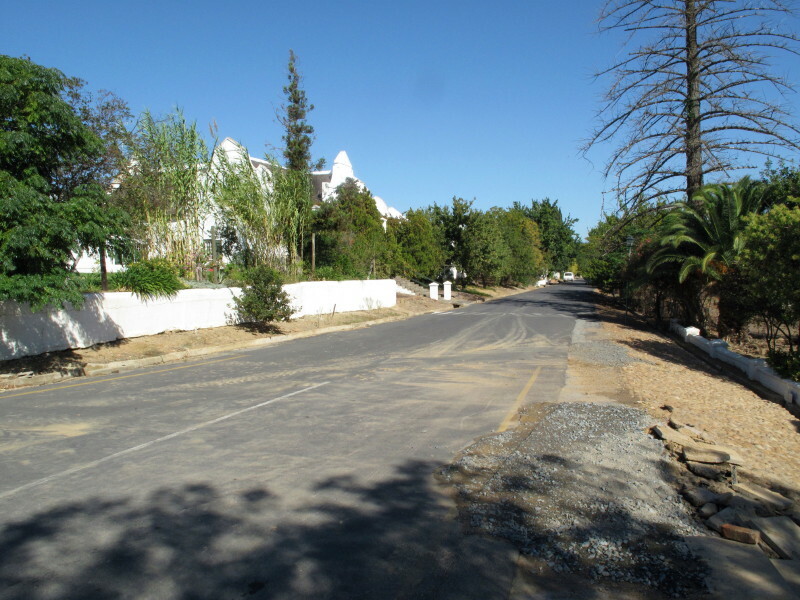 Schumacher picture of the exit on the Tulbagh side. There is a short profile of Schumacher at the end of this posting. He called it Roodezand Kloof . Schumacher’s picture of the western entrance. My view is not quite as wide angled and it misses the Piketberg in the background. I believe Schumacher is using a bit of artistic licence to scale it up to make the picture more artistic – though he was further to the right than I was. Notice in this picture that the main road is on the south bank but there is also a smaller track on the north bank – that is the river between. 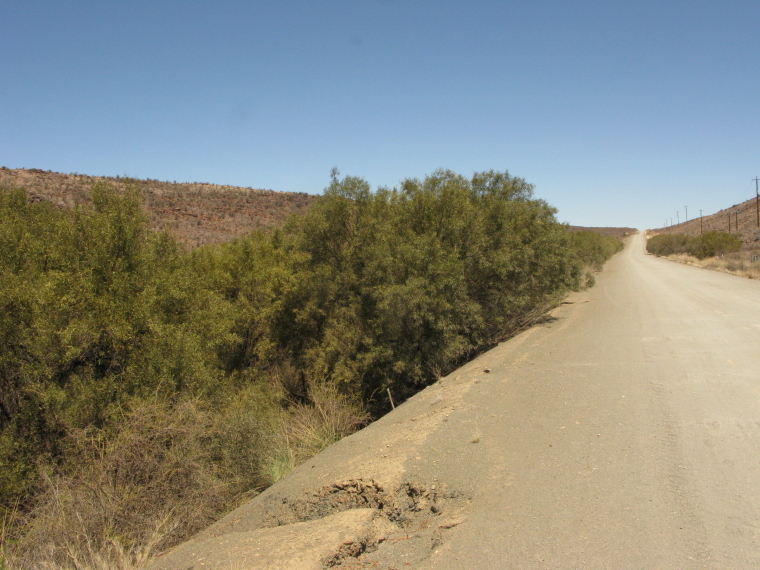 In the previous Schumacher picture the road has crossed over to the same side as Burchell shows it. Zooming in on the rock outcrops to better show how faithfully Schumacher portrayed them and that the main Cape to Reef railway passes between them. 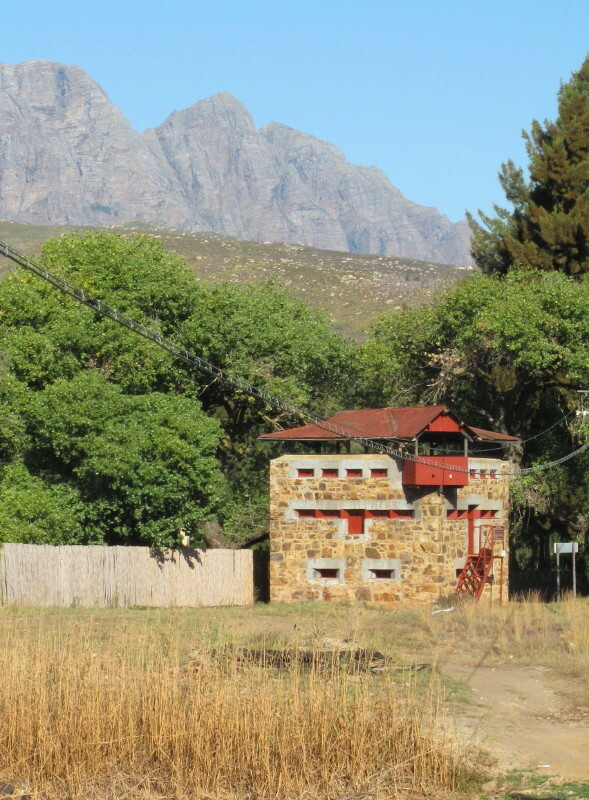 Burchell found that his wagon was overloaded so he bought an additional reconditioned one in Tulbagh and extra oxen. 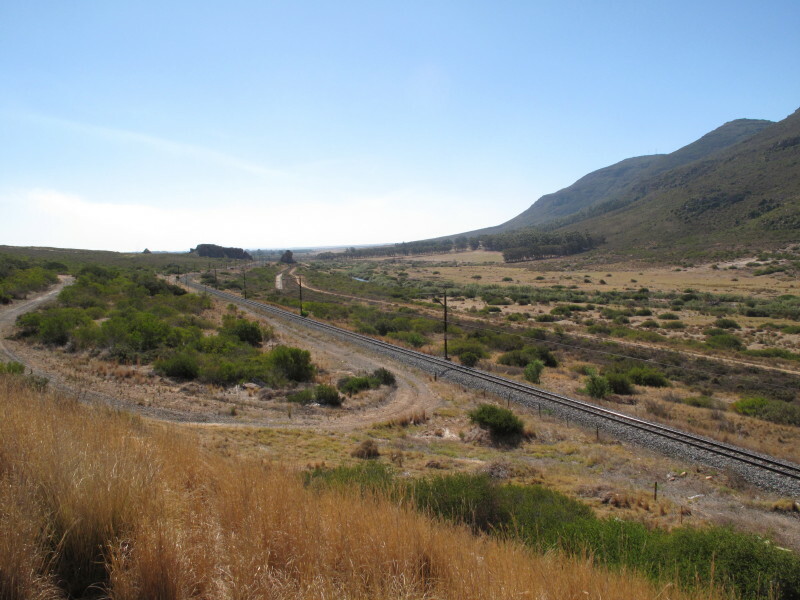 Part of Burchell’s party went through Mostert’s Hoek (where Michell’s Pass now is) taking the spare cattle & livestock but the wagons could not go that way. 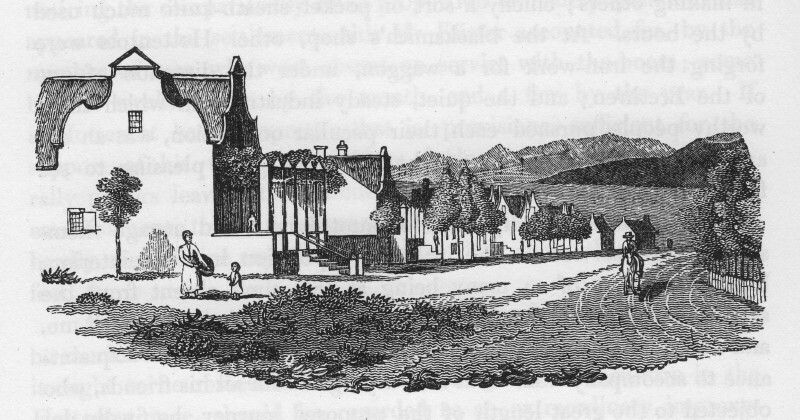 Burchell’s engraving of Church street in Tulbagh. The windows are not nearly as tall as Burchell shows them to be. 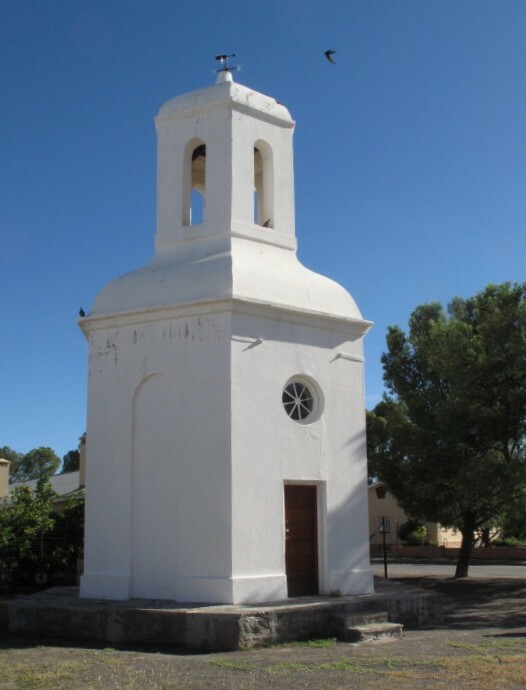 The drostdy in Graaff-Reinet was also designed by Thibault and should have been very similar but the local builder could not read a plan so he did his best. 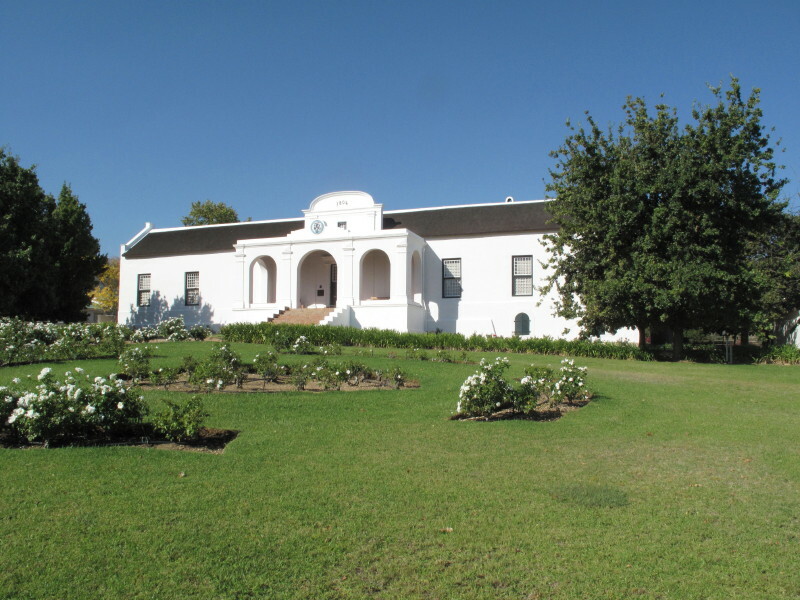 Burchell went to Graaff-Reinet twice later in his travels. He provides this engraving of the drostdy there. I took this photo of it. 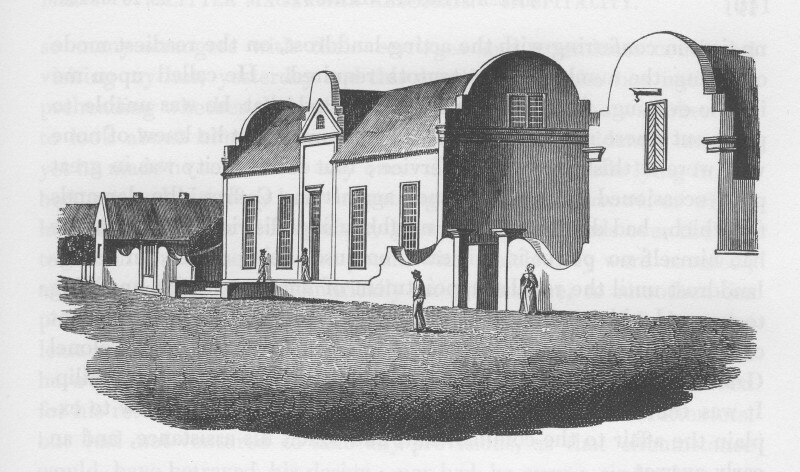 Louis Michel Thibault was commissioned to design a building which when finished, deviates in many particulars from his design, conforming more to the traditional style, though it did have the segmental gable that Thibault designed. *Source* which also talks of a portico. 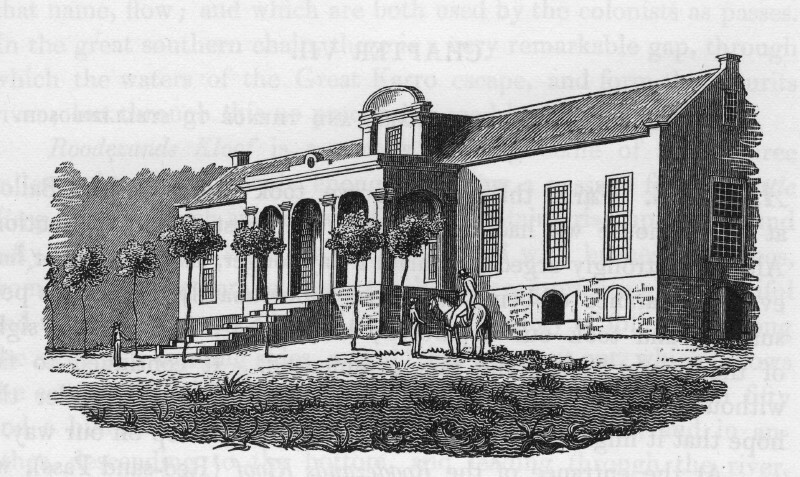 You can see that it to have small square windows like those now on the Tulbagh drostdy (but not in the Burchell engraving). I must confess I prefer the traditional sash windows that the builder substituted. Hans Fransen in Old Towns and Villages of the Cape includes this picture by Burchell which is not in my book. I include the caption as it evaluates the worth of Burchell’s work. To appreciate the value of Fransen’s opinion here is the link to the citation for the Honarary Doctorate awarded to him by Stellenbosch University (his second honorary doctorate) *here*. From the picture it seems that if it had a portico it would have protruded into the street. It became an hotel and had a second storey added. 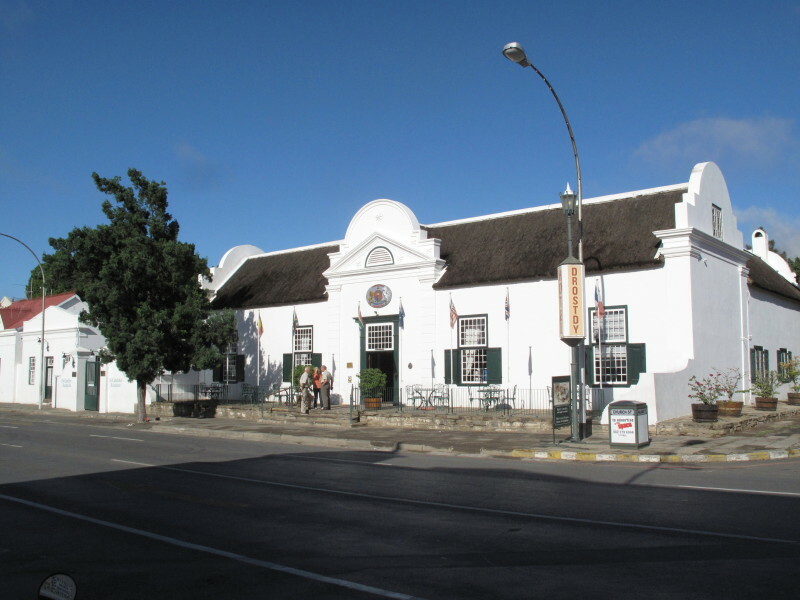 Graaff-Reinet was the birthplace of Anton Rupert who invested a lot of money into restoring and preserving the town – this is one of the buildings he restored. EDIT 2017/03/01 I have recreated the thread about the gables along Church Street. The site it was originally posted on has closed. The new thread is on Wild Dogs and I have fixed the hot link above to take you there. Schumacher. 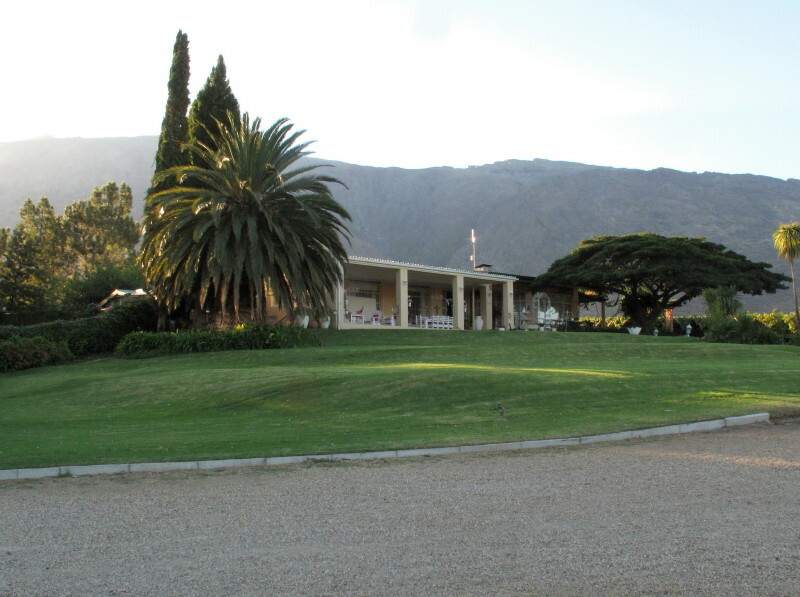 Winterhoek farm. This is the Tulbagh valley. I am not as high as Schumacher was. EDIT April 2011. Schumacher creates aerial views to better show the lie of the land. There is no hill or anything he could have climbed to give him this perspective for this picture (and many of his others). Burchell went through where Worcester now is ( Worcester founded eight years later in 1819 when the British had possession of the Cape). 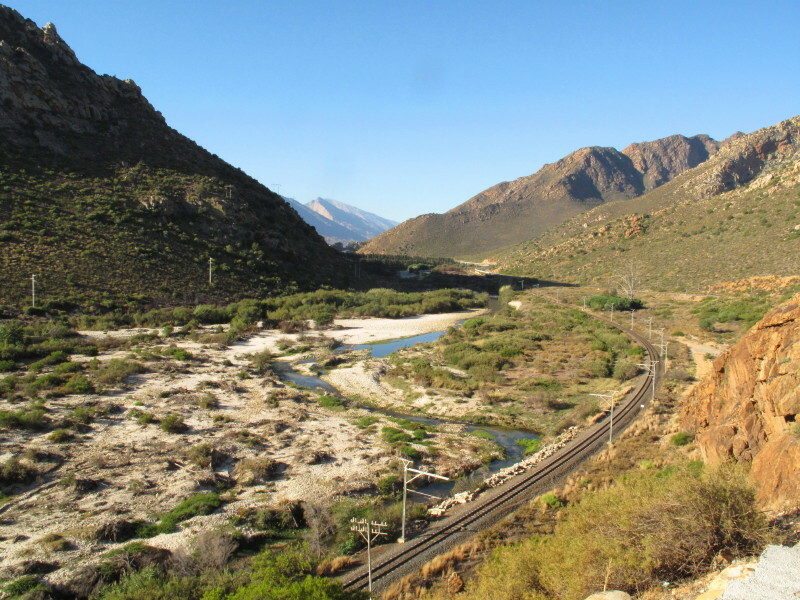 The Hex River Kloof was quite a barrier for them to get through to where De Doorns now is; extra oxen were provided by a local farmer to assist him get his wagons through this river bed and the rocky gully just before you enter De Doorns. 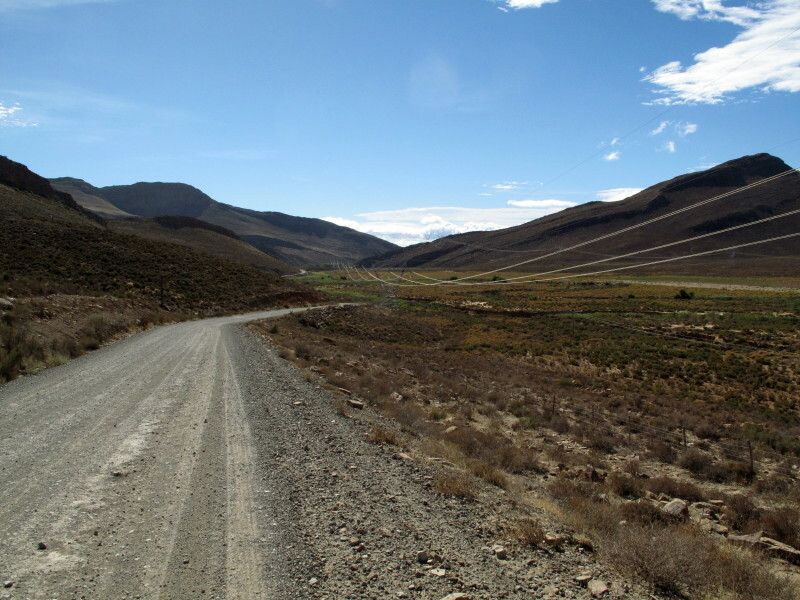 The next day Burchell was again given extra oxen for the ascent of the pass but he hardly mentions it – it was not nearly as difficult as the poort before De Doorns. The pass can be seen in this picture. At the top turn left. This is the road from the N1 across to the Ceres/Sutherland road. 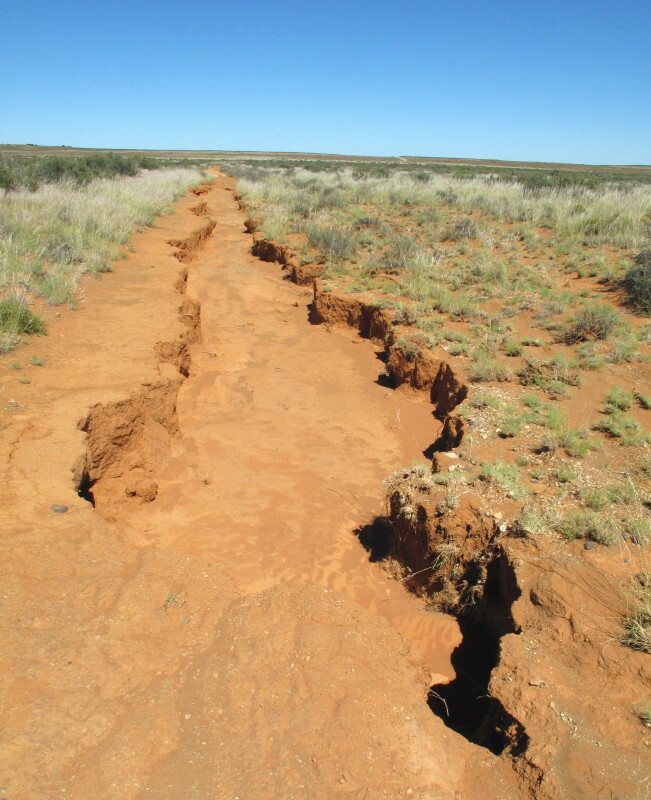 Burchell came through here as it was the way to get into the Karoo. 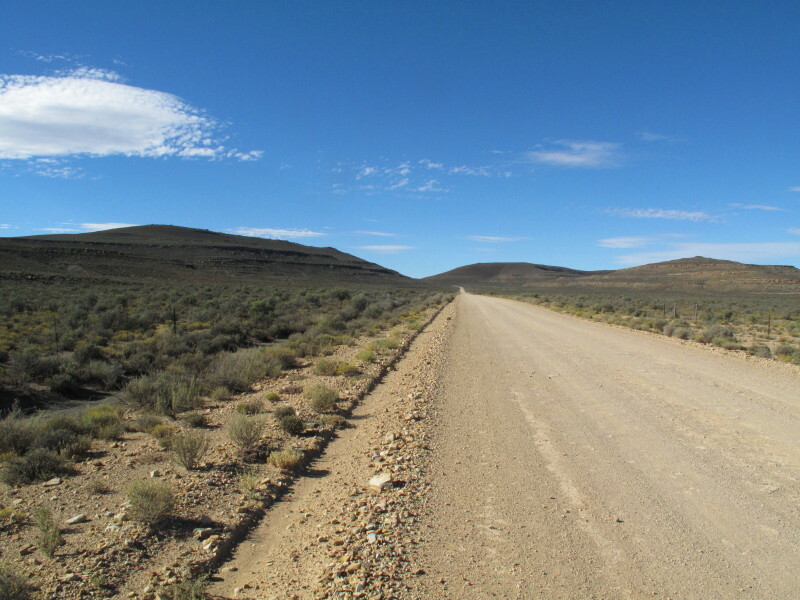 Verkeerdervlei gives its name to this road. When Burchell went past there were lots of birds on it. This is the Ceres/Sutherland road before the R355 splits off to Calvinia. 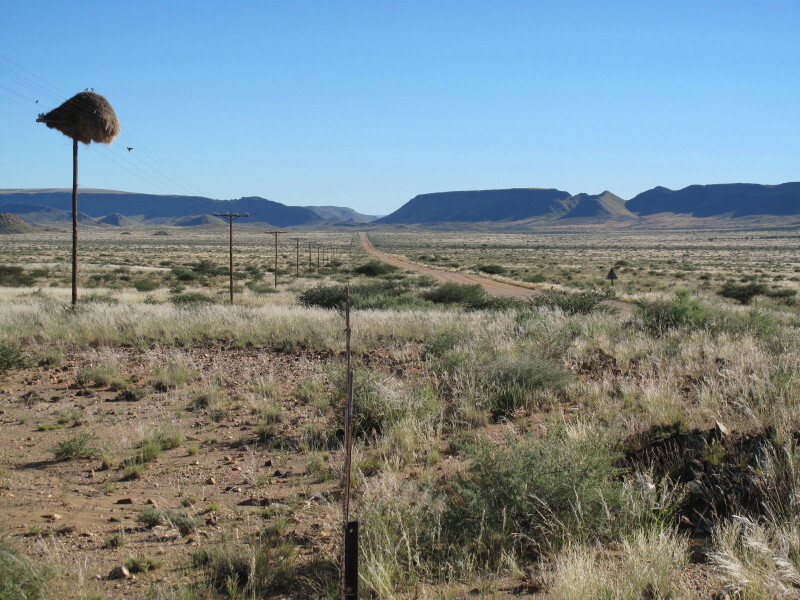 The poort is called Karoo Poort; it was the connection through to the Karoo. Very important because the VOC depended on the trekboers of the Karoo for a lot of the meat they supplied to the company ships. 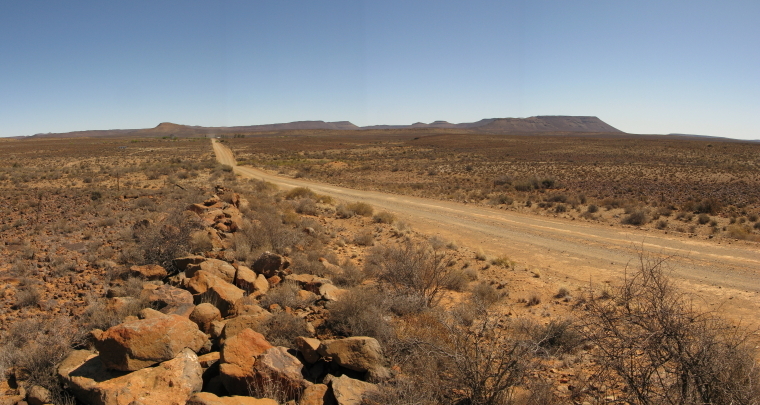 Karoo Poort . Burchell’s wagons under large Karee trees. My bike with the same skyline and also karee trees (my view is wider angled and Burchell was slightly further to the left). Something I realised on this trip is we in the WC have authorities who do a little to improve the environment; like planting these trees and mowing the grass. I wonder for how long it will continue. 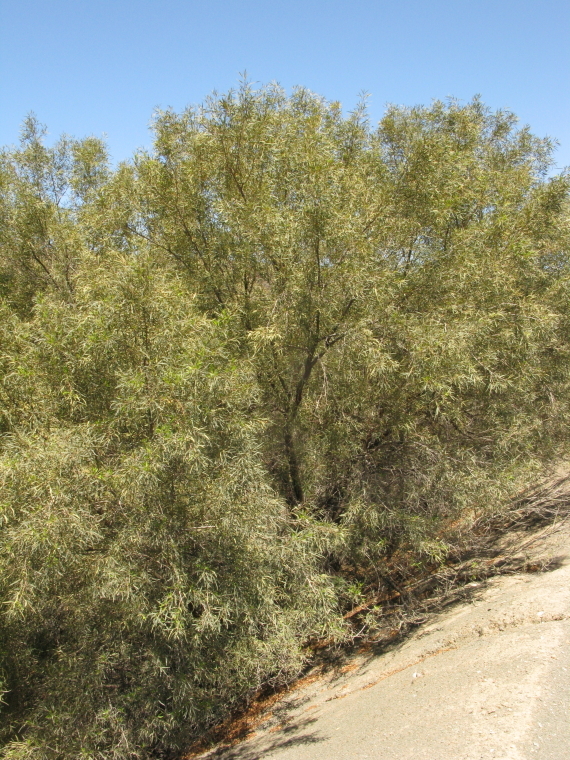 Also Karoo Poort with much older tree looking more like Burchell’s trees but it is actually a thorn (Acacia) tree not a Karee. EDIT 2017/02/10 I have added the gps tracks for each day's ride onto the first post in this thread. The introduction is often skipped so I thought it advisable to add a note here. If you download that track you will find I had to make a big diversion to the south of the N1. 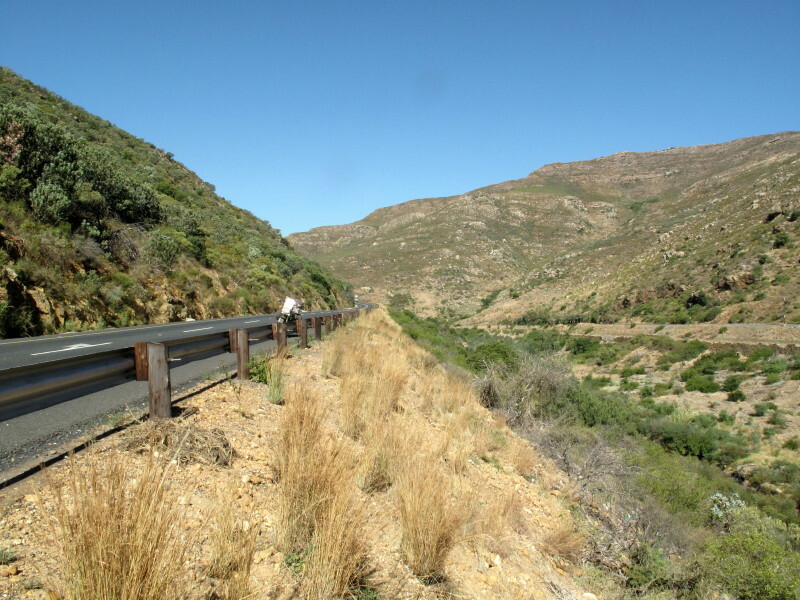 Garmin had indicated a place to stay at the head of the Hex River Pass. When I went there it was closed so I headed for the next place it showed. This is sparsely populated territory; it was to the south of the N1 on the road that leads to Koo. That place too was closed. So I went on to the next place which was even further away from the Burchell track. This place was a youth camp for school children. They do not accept casual visitors but saw my plight and took me in. Treated me very well. There is nothing in Wikipedia about the artist Johannes Schumacher and even Google will find you nothing of significance. Next to nothing is known about him. He was a wandering artist from Germany who was employed by Hendrik Swellengrebel to record scenes on his travels. Naïve art is a classification of art that is often characterized by a childlike simplicity in its subject matter and technique. While many naïve artists appear, from their works, to have little or no formal art training, this is often not true. You will see that he simplifies and reduces the picture to a few lines but it is an accurate, though stylised, representation of the scene. He was friends with, and had a strong influence on, another very important artist, Robert Gordon (a Dutchman despite his name). Fascinating. I was chatting to a friend recently and we both expressed sadness when we see civilization creeping up and taking over the beauty of this country. It's great to be able to see that there are still parts that haven't been spoilt over the years. Hond se kierie... Dis moerse die!!! I love history, geography and the wildernesses. I often stop and wonder what has gone before. But, even though I know I don't have the patience to do something at this level and magnitude, I am highly appreciative that I can vicariously do it through your contribution and this site. The additional benefit to me is that when next on my travels through parts that you've documented I have so much more to draw on. The missionaries persuaded Burchell to delay his departure by seven months (1:i10) as they were very afraid of being attacked by the San and wanted him with them as he had guns and plenty of gunpowder. There was also a report that a band of 500 disaffected Xhosa was planning to ambush them in the Kareeberg (1:64 1:185 1:223 1:227 1:268). 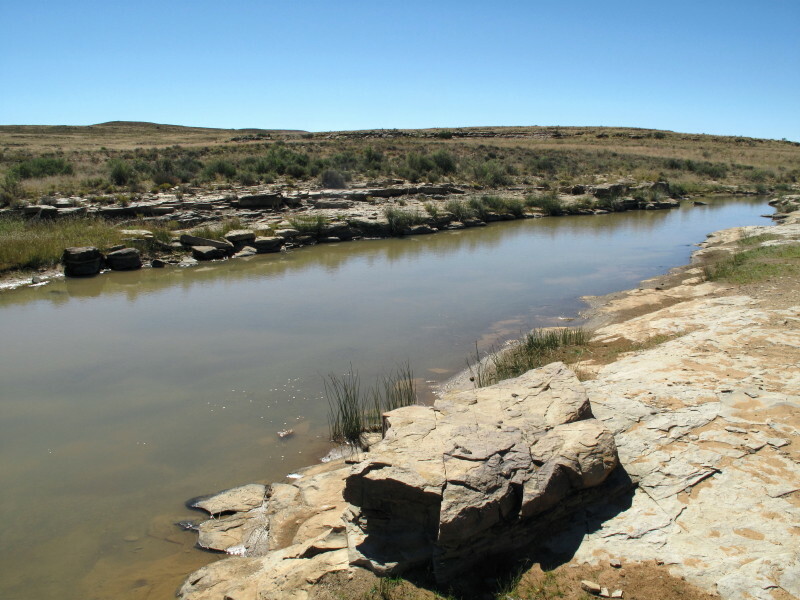 They all met up at the Riet river between present day Sutherland and Fraseburg (1:265). The party was 97 all together in 8 wagons. 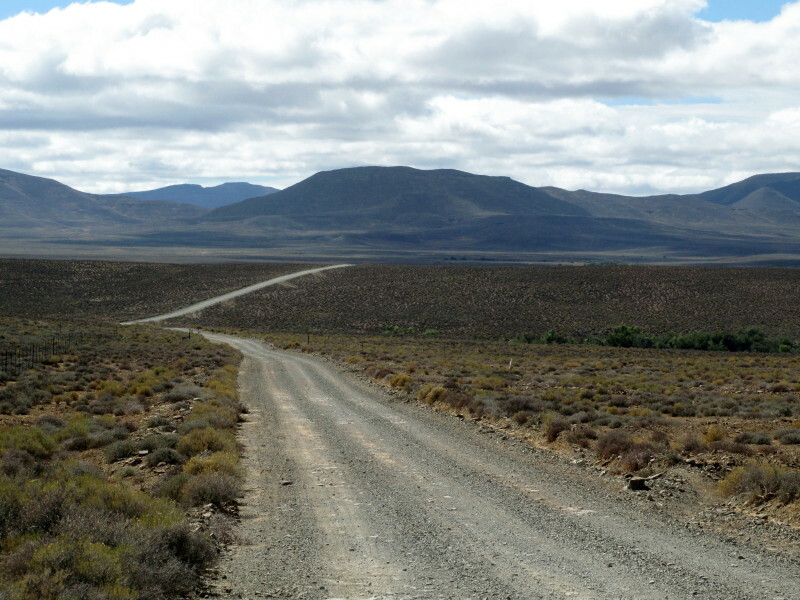 The route they took across the Great Karoo has become the road from Sutherland to Prieska. The Xhosa party was waiting for them at the Riet rendezvous point – 5 males & 5 women! This is an example of how small pieces of information became distorted out of all proportion – there is another classic case where Graaff-Reinet was placed on a war footing as it expected to be invaded by 300 Klaarwater Hottentots led by a white man (2:136). The party was, in fact, Burchell plus 6 Klaarwater basters, a San youth & a Tswana man (2:15). Such was the suspicion, false information, exaggeration and paranoia amoungst an ill informed community. They did meet up with San in their journey across the Karoo but they were assisted by them. 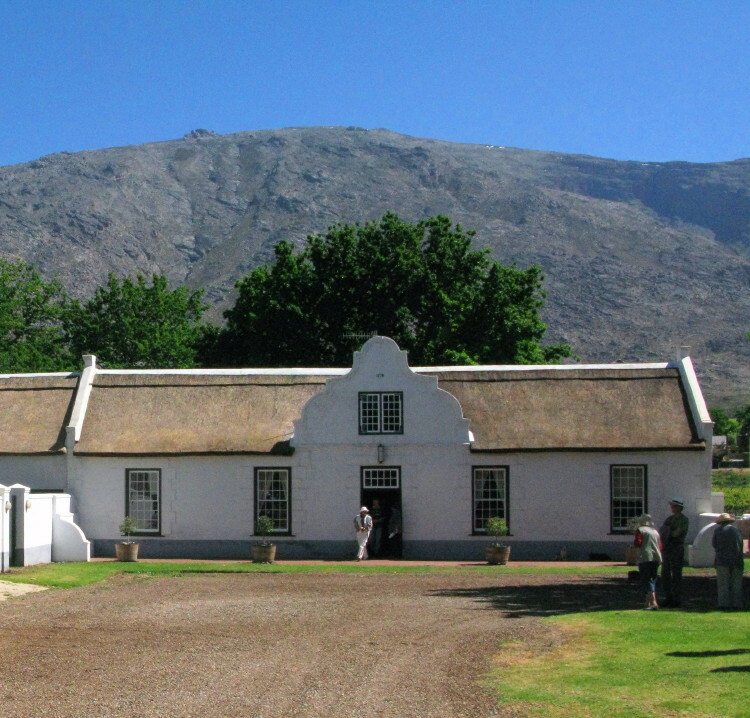 Besides these Hottentots, a party of five Caffres, and their wives, were resting here. These men were not less than six feet in height, strong and finely proportioned; and, excepting a leathern kaross, wore no covering whatever; a circumstance, as far as I have since been able to learn, quite peculiar to the Kosas, or Caffres on the eastern side of the colony. Their bodies and cloaks were reddened all over with ochre mixed up with grease. They accosted us in an easy manly tone, and with manners perfectly free from servile timidity. These, with seven others left on the Sack River, had come from their kraal on the Gariep, for the purpose, as they stated, of bartering in the colony for tobacco; and begged the missionaries to give them a letter to the Veldcornet Maritz which however was very properly refused. We were rather surprised at so unexpected a rencontre with some of the very men on whose account so much uneasiness had been felt, and could not avoid suspecting them of being sent as spies to discover the strength of our party. We taxed them with the intention of attacking and robbing us in the Bushman country; and threatened them on our part with a warm reception, if they thought proper to make the attempt. But whether the report we had heard to this effect was really unfounded, or whether, seeing our caravan so strong, they thought it prudent to relinquish the plan, or to dissemble, they now affected the greatest submission, and the most friendly disposition. They protested vehemently against the falsity of what had been reported to us, and attributed it to the malice and jealousy of the Bushmen, with whom they had long been on hostile terms, and who, in a recent skirmish, had killed their chief, one of Sambie's brothers ; in consequence of which their whole kraal had meditated a return to their own country, or at least as far as the borders of Bruyntjes Hoogte. a handkerchief to protect them from the sun. It was impossible to avoid their importunities, except by granting what they asked for; and at last we got rid of them, by giving three legs of mutton, a hand¬kerchief for each, and a quantity of tobacco, enough for them and their wives. 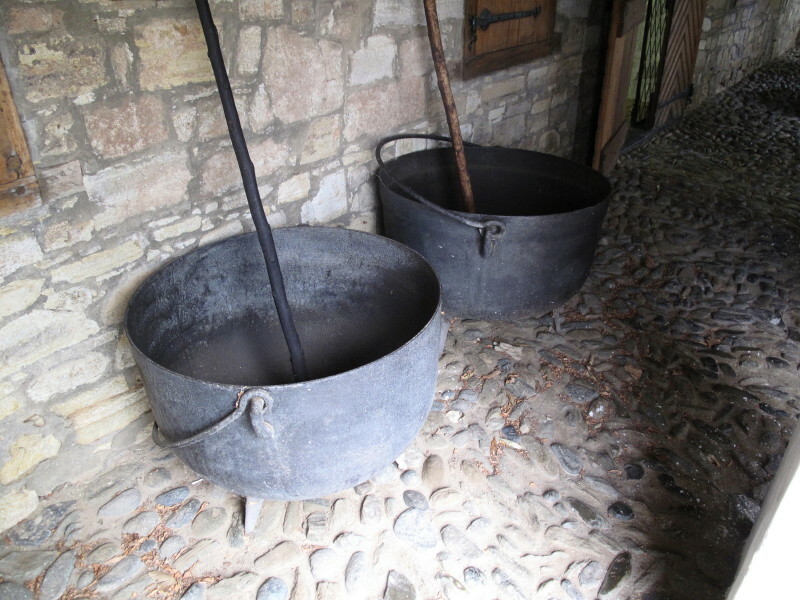 I purchased of one of these men, for a handkerchief, a very neat basket, wove with rushes so admirably close, that they are always used for holding milk or other liquids. He was careful not to let this opportunity pass, without begging for something; and first requested to have some brandy, which being refused, he imme¬diately asked for money to buy some; for these people are shrewd enough to understand very well the nature and use of the Cape money. Two of them could speak Dutch very readily; and the principal one, with a polite and friendly air, that I little expected in a savage, if such a term could properly be applied to him, gently raised my hand to his lips on taking leave, and expressed at the same time the warmest acknowledgments of gratitude for the presents I had made them. After this they quietly retired to their fire at the other side of a rising ground, about two hundred yards distant, where they passed the night. The missionaries were terrified of beggars it seems. 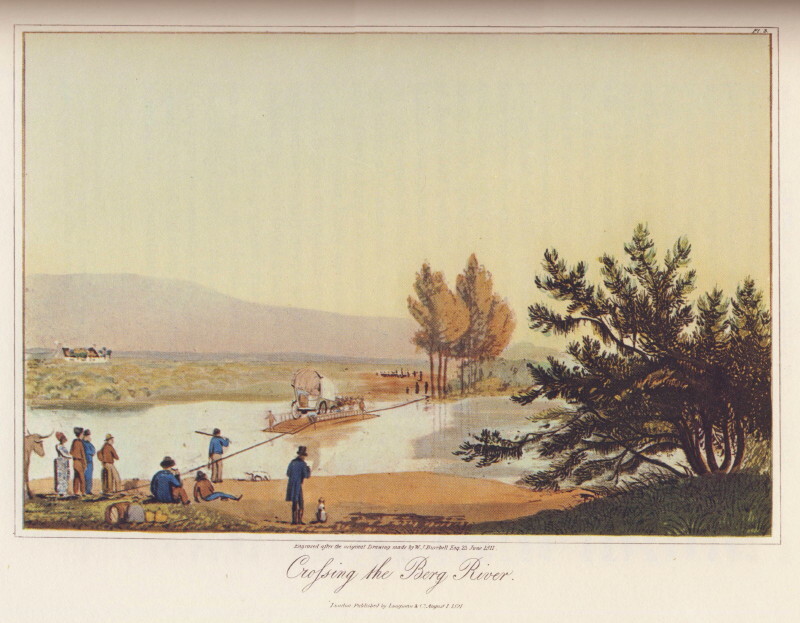 But notice this was 200 years ago and already some of them could speak Dutch, were living on the Gariep river and travelling to the Cape – very different from the history promoted by the previous regime. 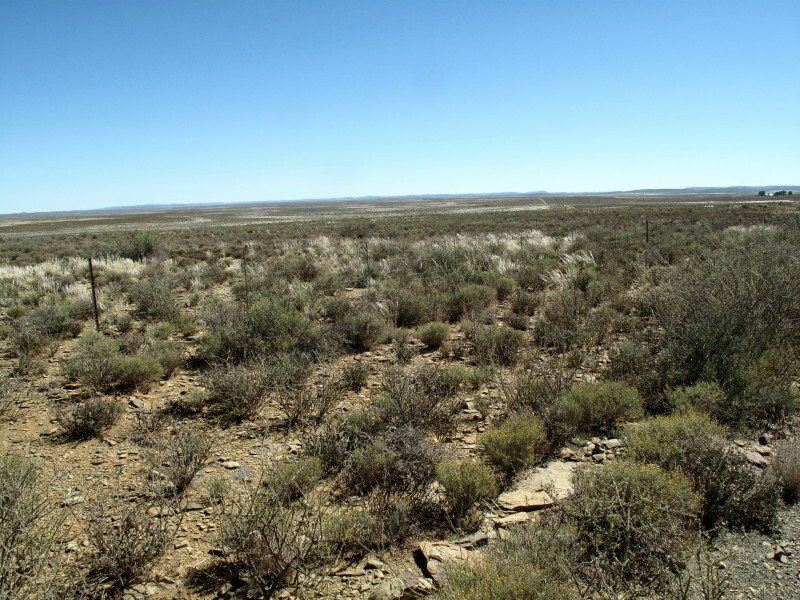 Having come through Karoo Poort there is a wide open plain between the Tankwa Karoo to the left and the Moordenaars Karoo on the right; Burchell calls it the Bokkeveld-Karoo but map #3220 has no name in that region. 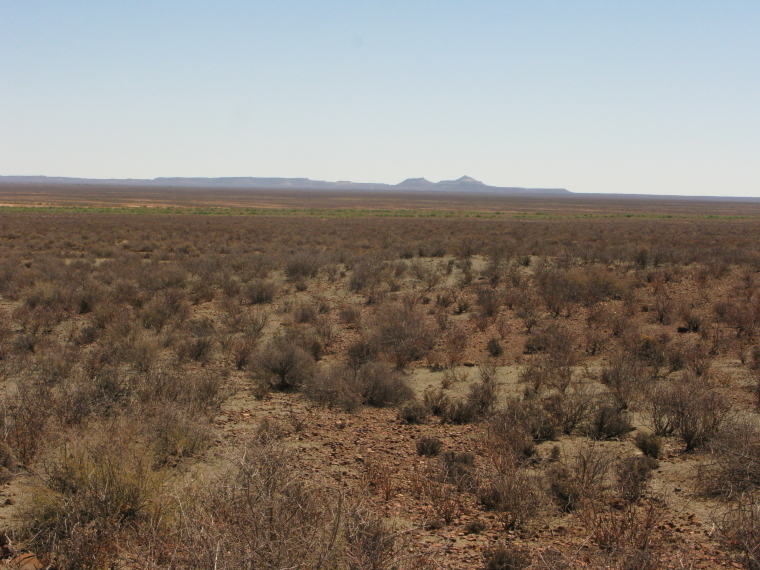 I would think the veld is still the same as when Burchell passed – nice easy country for ox wagons. Today the pass to Sutherland goes up the escarpment ahead and that is also where Burchell went. That is a tar road and I wanted to see the next pass to the east; Komsberg Pass. I have done both Gannaga and Ouberg (a real favourite of mine) to the north-west. 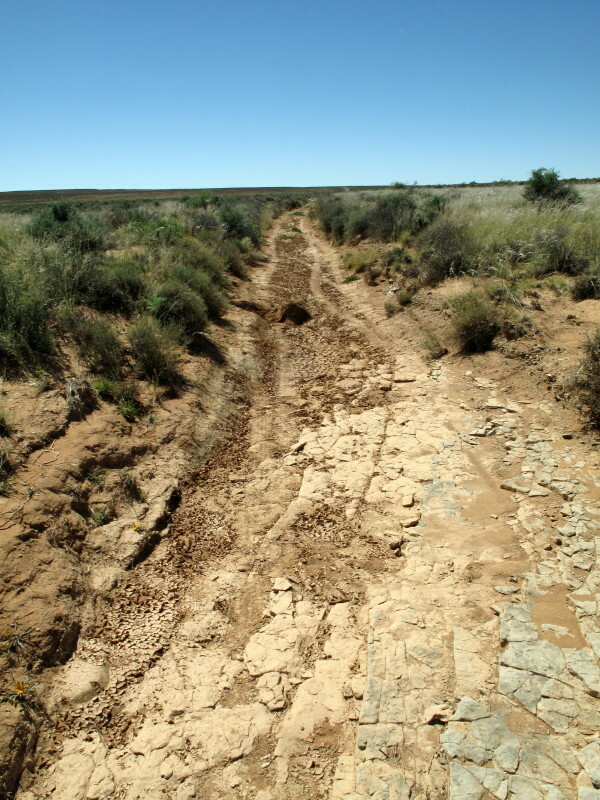 All these passes were used by the trekboers to take their flocks up to the Roggeveld in summer and back down to the Bokkeveld in winter. Komsberg pass is nothing like the spectacular other two; it goes up where the slope is much less steep as shown in the next picture. I wanted to see Salpeterkop. 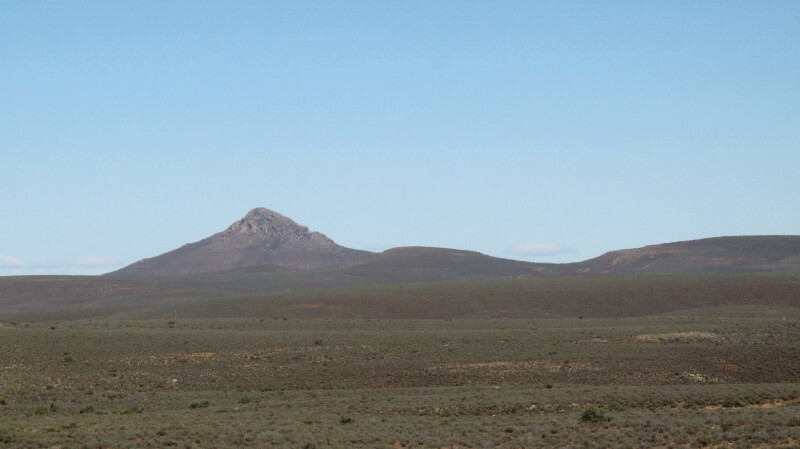 It is the last active volcano in Southern Africa but that was 66 million years ago. Several Sutherland sites have Southern Hemisphere in place of Southern Africa –right now there are active volcanoes in New Zealand. *More info here*. This is as close as I got; I had not programmed the road into my GPS & could not find the turnoff. 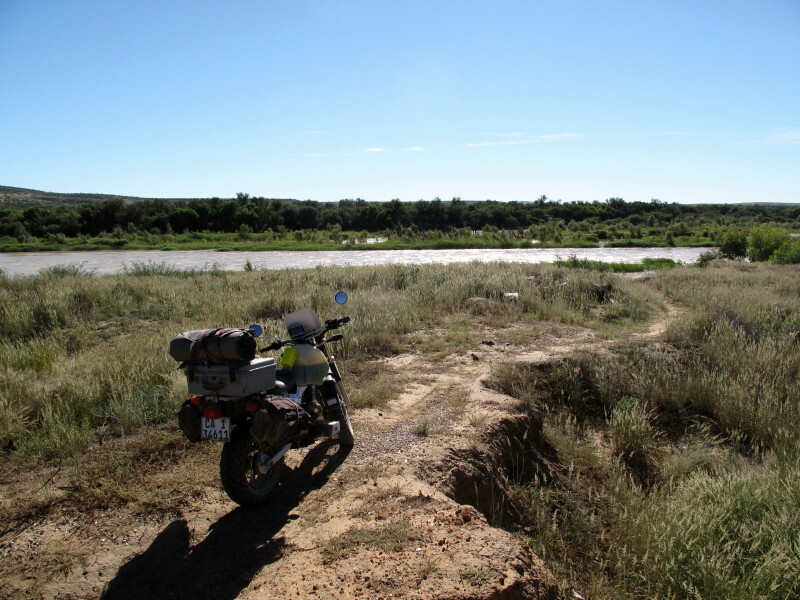 * long ride report about the Sak river * where I discussed the contest between the trekboers & the San. Here is a picture of a slightly upgraded version. 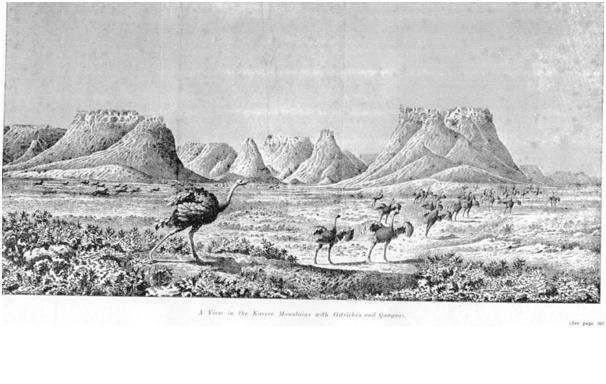 Those are fat tailed sheep in the Burchell engraving; the sheep of the Khoi that had originated on the Arabian peninsula and slowly spread across Africa. The trekboers farmed them too; when Burchell was here the merino sheep were just starting to be adopted by the most progressive local farmers. The first merinos had arrived 13 years previously in 1789 but it was not until the second British occupation in 1805 that the merinos really got going. 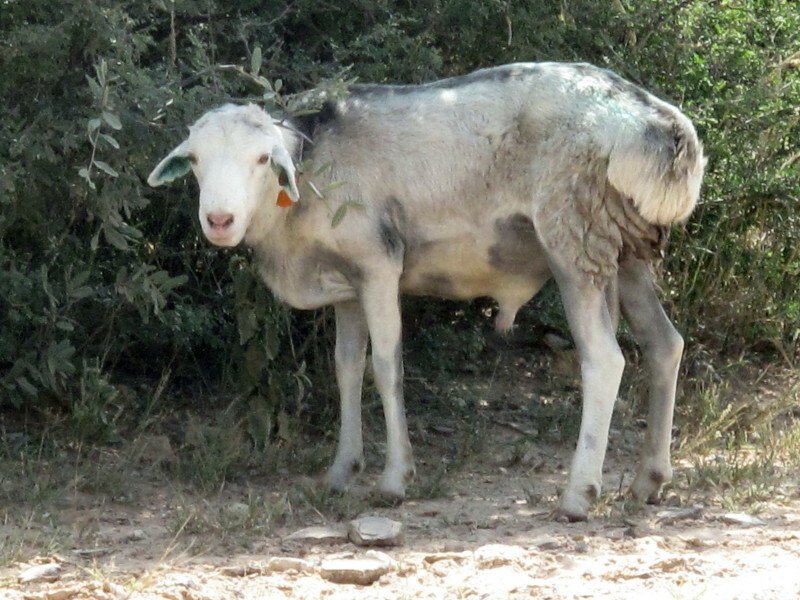 Later in the trip I saw this fat tailed sheep right at Heuningvlei. *Good info on sheep in SA - click history* Later in this post there will be a picture that includes a san dog which also looks just the same as the dog in the engraving. One of the prime uses of fat tailed sheep was to make soap. Here is an extract from Burchell (2.113). Note that the fat in the tail was worth the same, if not more, than the rest of the sheep & it could be accumulated during the year for easy transport to Cape Town. It also shows the elegant uncomplicated writing of Burchell. Not even the butcher's man, or slagters knegt , ever made his appearance at this distant farm; although the owner possessed a flock of not less than four thousand sheep; and many of his neighbours, not less than six. 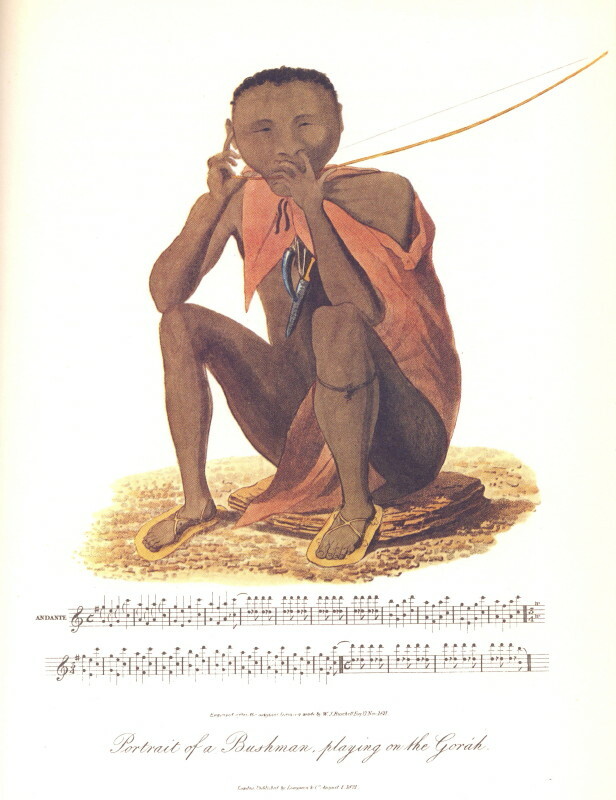 Still, however, the rearing of cattle was their chief means of subsistence : the family, with their slaves and Hottentots, being fed with mutton at every meal, caused a daily consumption of two sheep, the fat of which was considered almost equal in value to the rest of the carcass, by being, manufactured into soap. It was, as they in¬formed me, more profitable to kill their sheep, for this purpose only, than to sell them to the butchers at so low a price as a rix-dollar or less, and even so low as five schillings. Formerly the alkali necessary for this manufacture, was obtained here from the Ganna¬(or Kanna-) bosch ; but that being at length, all consumed through a constant demand for it, another species of Salsola growing wild growing in many parts of the country, was taken as a substitute, and found to be even preferable to the ganna. In the house, I saw a great number of cakes of this soap, piled up to harden, ready for their next annual journey to Cape Town ; whither they go, not merely for the purpose of selling it, but of purchasing clothing and such other articles as are not to be had in the country districts, but at an exorbitant price. 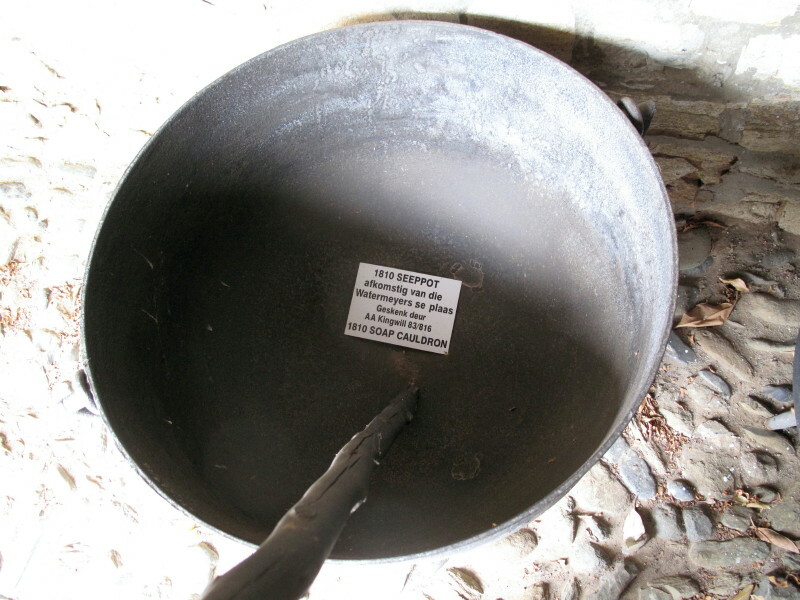 In Graaff-Reinet I saw this soap cauldron. They are surprisingly big; at the Reinet Museum. 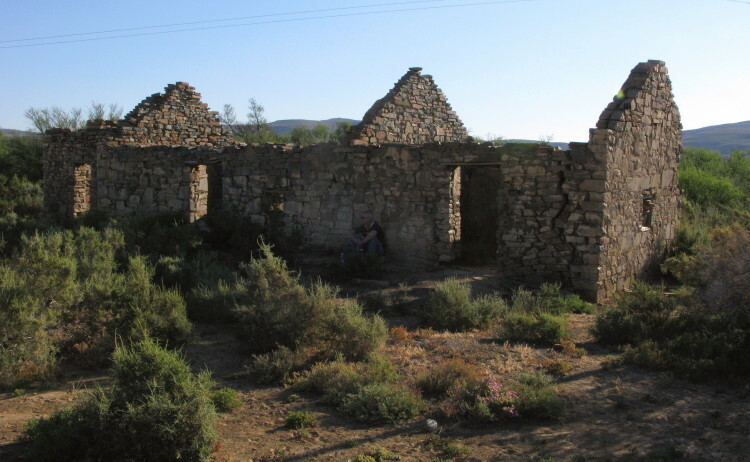 I went on a Vernacular Architecture Society outing to the Great Karoo that included a visit to the ruin of the building Burchell drew. It is in very good condition. Because wood and metal is a scarce commodity in that region it has all been removed from the building but the walls remain. There are no doors - it is the plastered opposite inside walls that appear to be doors. From Sutherland I took the nice gravel highway to Fraserburg (tar as far as the observatory) for the night. 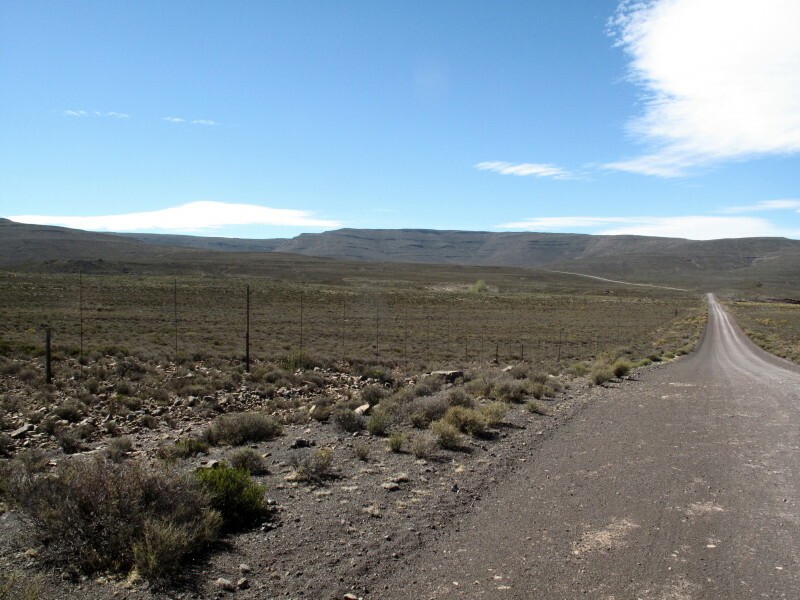 I enjoy cruising Karoo highways. There is this small building called the Peperbus built in 1861 as an office for the predekant. Why it was so small is a mystery to me, and why did he need a bell above his office? I enjoy folly buildings like this. It is hexagonal though that is not apparent in this picture. If you go into the back streets (there are not many) you will find a town that has not been re-developed so the buildings are still as they were 50 or more years ago. It is becoming more and more difficult to see what our towns used to look like. Not spectacular but that represents what a small country town used to look like – single storey houses with a stoep directly onto the street. 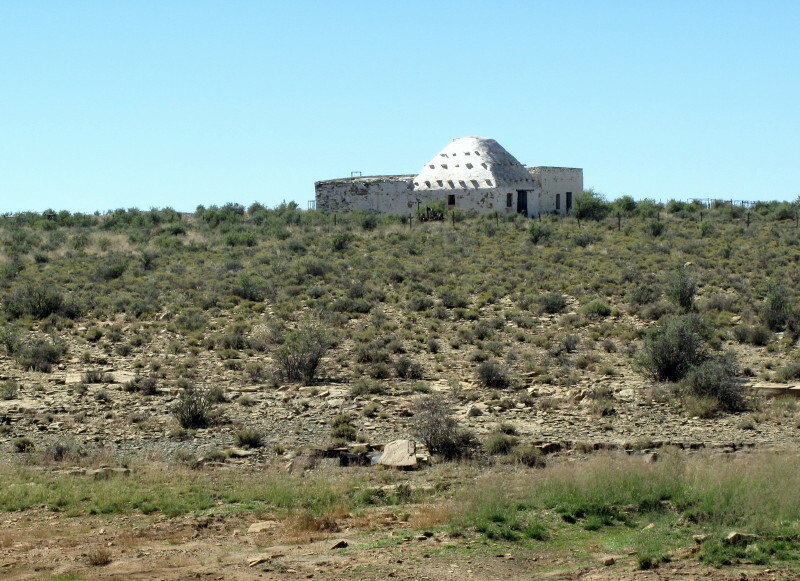 Many with flat roofs in the Karoo. I did not know where the Sak River Mission of Kicherer was when I did that trip. From the Burchell book I learned exactly where it is (slightly downstream from here close to Kerkplaas farm). I made a mental note to look for the turning but missed it. Many of the red dashed roads on the 1:250 000 maps look exactly like private farm roads. I have now learned that you have to program them into your Zumo route as named waypoints if you want to be sure of finding them. Burchell has this picture of their camp alongside the Sak river. It is a big three page fold out landscape picture. My photo of it can not show the detail that is in the full sized original. I forgot about this painting so failed to take a matching photo. This is close by but after crossing the Sak. 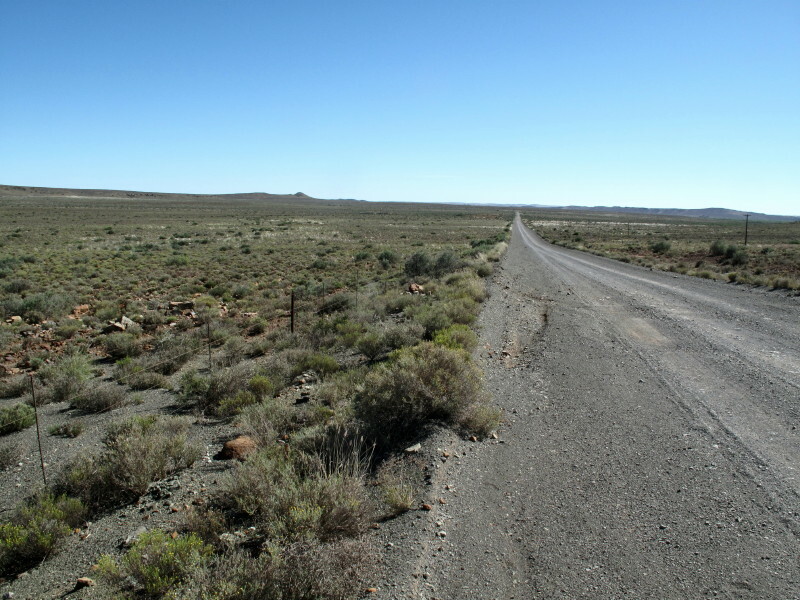 Now we really are in the Great Karoo – the part where they were going to come across the fierce San. 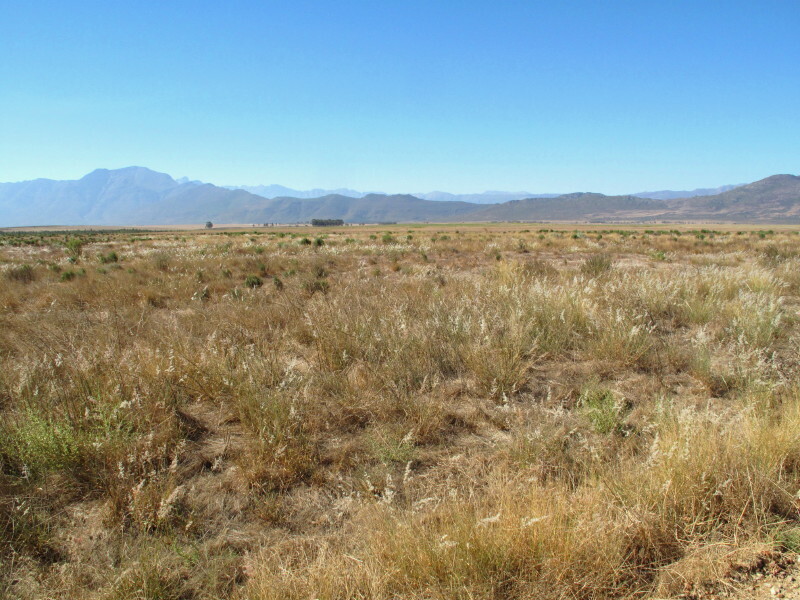 It still looks the same as when Burchell came through except I hear it takes 30 years for the vegetation to really recover from sheep grazing – for the tastiest plants to reappear. My wife, Antonia, is an occasional outside lecturer at the Archaeology dept at UCT. They have been examining the Sak River Mission Station so from them we learned where it is and gained permission to access it as it is on private land & quite far from the road. We went there in my Terios in 2015. When I planned the original bike trip I knew approximately where the mission station was and noticed on the 1:250 000 map a farm named Kerkplaas which I guessed got its name from the mission. It is there but the farm has since been subdivided and Kerkplaas no longer contains it. It was a blazing hot day and we were there at noon. You can recognise the shape of the hills from the drawing but this is actually looking from the west side. The mission is on the opposite (east) side of the hills. We went through but did not see the actual ruins – it was too hot to want to bash around much looking for them. Some of the smaller roads were fun. A donkey karretjie had been down here some time before me. Hitherto, we had not seen a single native; a circumstance occasioned, most probably, by their universal distrust of all strange visitors from out of the Colony. But having, by their spies and observations, satisfied themselves that we were friends, a party of eleven Bushmen, with three women, paid us a visit this morning. They were, in stature, all below five feet; and the women still shorter; their skin was of a sallow brown color, much darkened by dirt and grease. Their clothing appeared, in my eyes, wretched in the extreme; but, doubtless, not so to them, as they all seemed con¬tented enough; although, when we first met, I observed in their looks great mistrust, and symptoms of much fear. These gradually wore off; and, after we had confirmed the assurances of our peaceable intentions, by presents of tobacco and beads, they recovered their natural tone, and chattered and clacked with each other in a very lively manner. Among them, were some young men, whom, with all the remains of ancient prejudices, I could not help viewing as interesting. Though small, and delicately made, they appeared firm and hardy; and my attention was forcibly struck by the proportional smallness, and neatness of their hands and feet. This conformation is common (perhaps in Africa, peculiar,) to all the Hottentot race. The women were young; their countenances had a cast of prettiness, and, I fancied, too, of innocence: their manners were modest, though unreserved. Their hair was ornamented with small Cowry shells*, and old copper buttons, which were interwoven with it. One of them wore a high cap of leather, the edge of which protected her eyes from the sun: at her back, and, entirely hid excepting the head, she carried her infant, whose exceedingly small features presented to me an amusing novelty. The poor little thing bore all the rough jolting motion, with a degree of patience and unconcern which plainly showed it to have been used to it from the day of its birth. * Cyprwa moneta. Linn. These shells are not the natural produce of this part of Africa, but have been passed on from one tribe to another, in the course of barter. 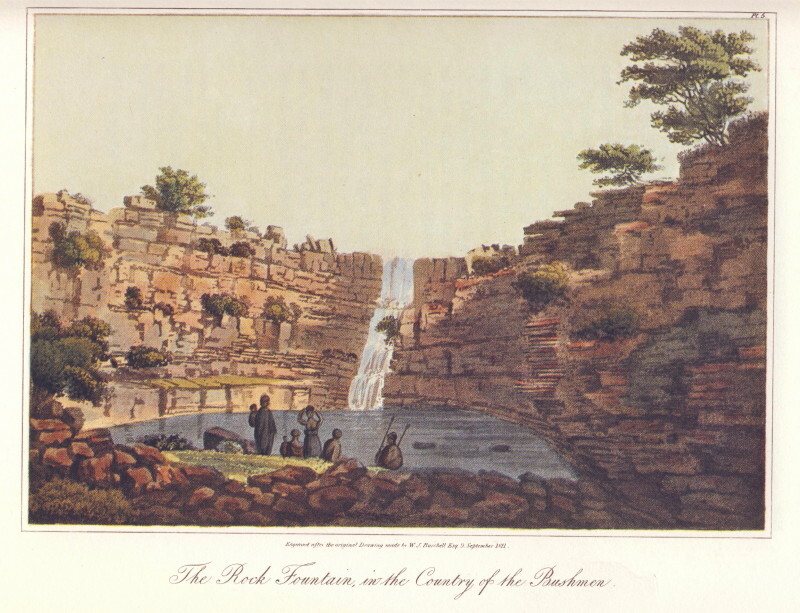 I was descending alone to view the spring, the value of which I had heard our people so much extol, as affording the traveller a never-failing supply, when one of the Hottentots called out, advising me to take my gun, lest, seeing me unarmed, some evil-disposed native might be tempted to attack or rob me. He remarked very prudently, and, I believed, properly, that it is safe always to suspect that such men are lurking behind every bush or crag of rock, ready to let fly a poisoned arrow on the unsuspecting passenger. I returned for my gun, resolving to keep his advice in memory; and I now impart it, with serious recommendation, to all who may hereafter find themselves in similar circumstances. friendly tribe, and belonging to a family or party of twelve, who had come from a neighbouring kraal to pay us a visit. What they said to me as I advanced towards them, I was unable to guess, being alone, and understanding nothing of their language. I felt, however, so much confidence in their good intentions, that I sat myself down on one of the large stones, and made a sketch of the spot, in which I inserted them exactly in the attitudes and situation in which they were at the time; and was pleased at finding ready before my pencil such picturesque appendages to the landscape. This scene is represented in the fifth Plate. I spent quite some time looking for this picture. Burchell gives the latitude; I thought the most likely place was north of the R63 where there is a river. I rode all along that river on farm roads but this is the closest to a rock pool that I found. 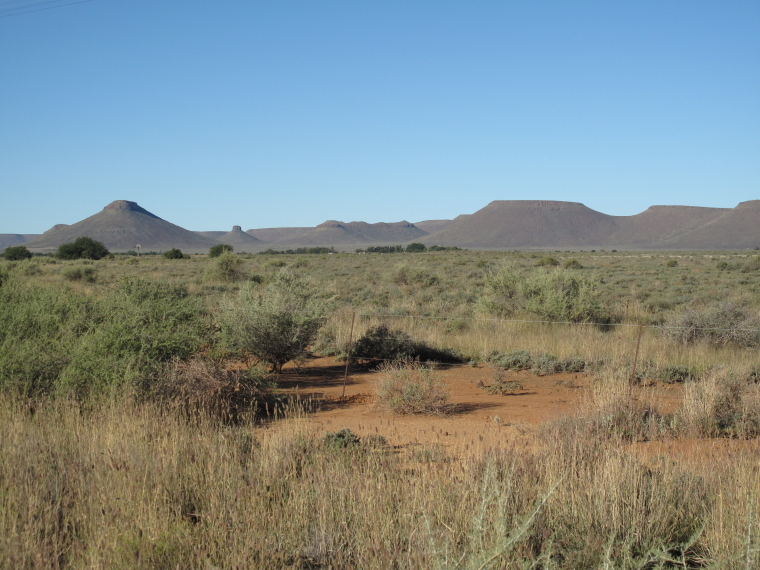 This is at S31° 02.393’ E21° 44.931’ which is within 2’ of the latitude Burchell gives. However McKay shows it as south of the road. 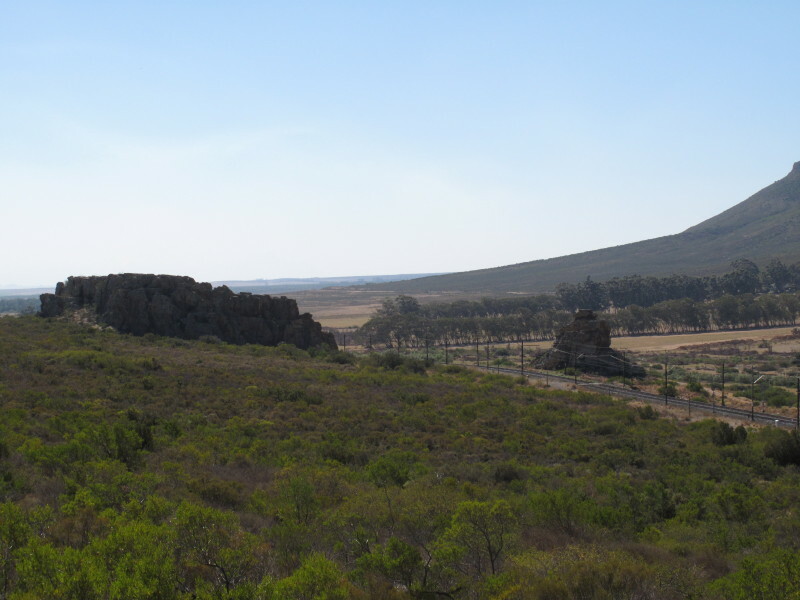 There are two farms named Witfontein – one where I went & the other where McKay suggests. I went to Leeufontein farm on the other side and asked the farmer’s wife if she knew of anything like the picture. She does not; unfortunately her husband was away as he is third generation in the area. They have children so I would have thought that they would have been invited to swim there. It is a mystery as Burchell is very reliable. She gave me the names of two people to ask in Canarvon but I felt I really did not have the time available. Bob did not come back with anything. Burchell gives the latitude of the site (in his weather log at the end of Volume 1 he also gives the longitude & that was done by the Lunar Distance Method (measure the angle between the moon and a given star – it varies according to longitude but it also varies each day so you also need to know the angle for Greenwich for that day). He gives the coordinates as 31° 0’ 38”S 22° 37’ 40”E that longitude is hopelessly wrong as it is well to the east of Canarvon but the latitude is fine. I looked along the Witfonteinleegte river – photo above. 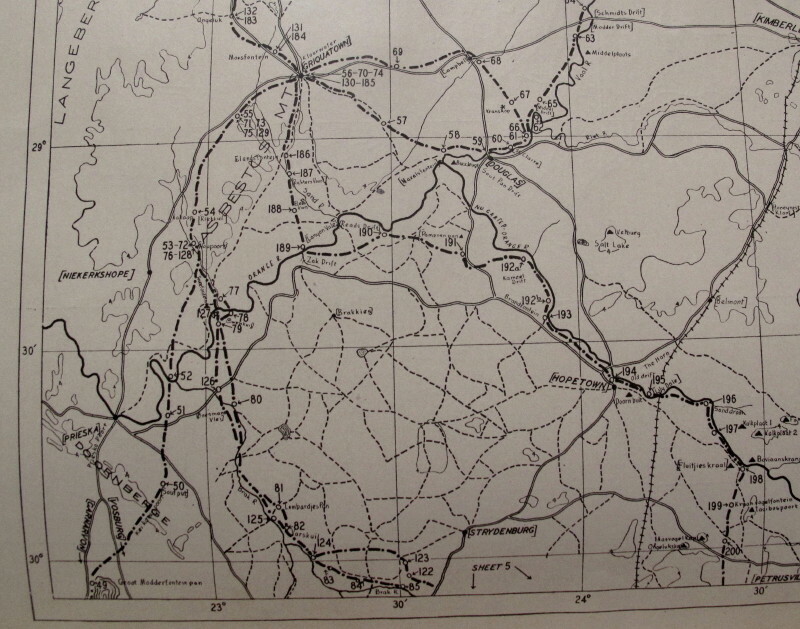 On the 1:250 000 map #3120 there is a farm named Kalkgat 517 on the Kalkgatleegte which joins the Witfonteinleegte at the R63. That name may mean something though kalk = chalk whereas Burchell’s picture does not show the typical ‘White Cliffs of Dover’. I would be pleased to be proven wrong but I believe Burchell’s picture is fantasy – wildly embellished. That implies his description of finding the place is also largely fabricated. I have quoted his full text above. It is so out of character for Burchell to embroider his report that I must hesitate before saying that I think it is embellishment. But what else can it be? There is no ravine thereabouts as far as I can see. Yet he writes that he made a sketch ‘of the spot’. My track is available from the first post = 100410 Fraserberg Stealth Camp. Can be loaded into Google Earth to see precisely where I went & what the terrain looks like. Goura. Burchell had a flute with him which he played regularly. The Khoi & San much appreciated it. You will see that Burchell has notated the very complex sound and repetitive tune created. So add musician to the list of Burchell’s abilities. The link above describes the Goura but I think Burchell’s is better (1:458). …especially an old man, their chief, who was considered a good performer on the Gorah, an instrument of the greatest antiquity of all those which are now to be found in the hands of any tribe of the Hottentot race. Curious to see and to hear a genuine Hottentot musical instrument, I gave him to understand that I wished him to bring it on the morrow, and give me a specimen of his playing ; to which he readily agreed. On the morrow he returned; bringing with him, not only his Gorah, ….. The Gorah, as to its appearance and form, may be more aptly compared to the bow of a violin, than to any other thing but, in its principle and use, it is quite different; being, in fact, that of a stringed, and a wind instrument combined: and thus it agrees with the Eolian harp. But with respect to the principle on which its different tones are produced, it may be classed with the trumpet, or French horn; while in the nature and quality of the sound which it gives, at least in the hands of one who is master of it, this strange instrument approaches to the violin. It consists merely of a slender stick, or bow, on which a string of catgut is strained. But to the lower end of this string, a flat piece, of about an inch and a half long, of the quill of an ostrich, is attached, so as to. constitute a part of the length of the string. This quill, being applied to the lips, is made to vibrate by strong inspirations, and expirations, of the breath ; each of which ending with an increased degree of strength, had always the effect of forcing out the upper octave ; exactly in the same way as produced on the flute, an instrument, therefore, which may be made to imitate the gorah sufficiently near to give some idea of it. The old musician, seating himself down on a flat piece of rock, and resting his elbows on his knees, putting one fore-finger into his ear, and the other into his wide nostril, either as it so happened, or for the purpose, it might be, of keeping the head steady, commenced his solo, and continued it with great earnestness, over and over again. 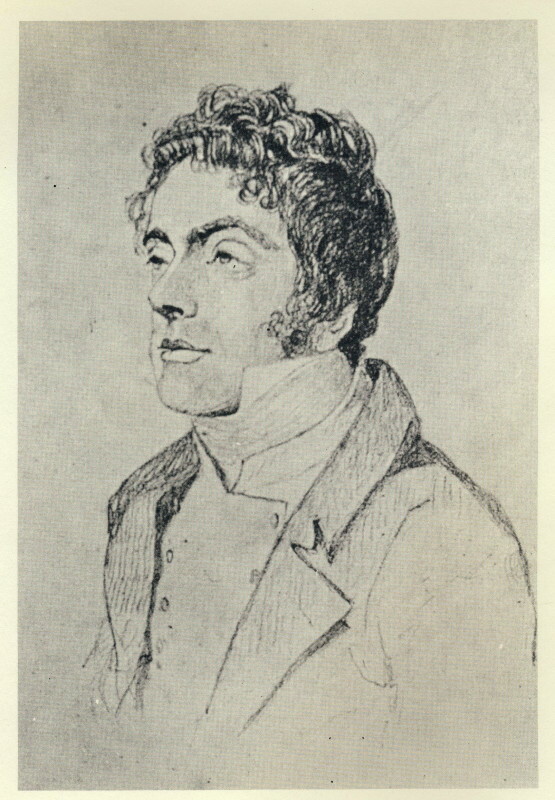 The exertion which it required to bring out the tones loudly, was very evident; and, in his anxious haste to draw breath at every note, our Orpheus gave us into the bargain, intermingled with his music, certain grunting sounds which would have highly pleased the pigs; and, if any had been in the country, would indubitably have drawn them all round him, if only out of curiosity to know what was the matter. Plate 9. His dress, reddened by an ochraceous earth, consists only of a leathern kaross, which is of smaller dimensions than those customarily worn. Suspended from his neck, is a knife of African manufacture, such as are worn, in a similar manner, by all the tribes in the Interior. The horn of one of the smaller antelopes, hanging from the same place, serves the purpose of a snuff-box, or receptacle for powdered dakka, or hemp-leaves. Below the knee, a cord of acacia-bark was worn as an ornament. The sandals are such as form part of the aboriginal dress of all the natives of Southern Africa, with no other variation than in the mode of their being bound to the foot. 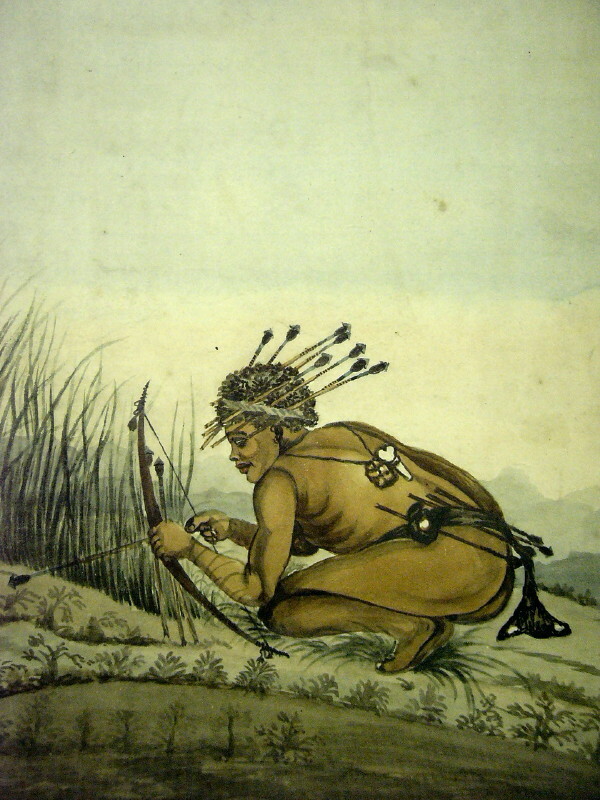 In Bushmen who are a little advanced in life, the eye-lids are often so much closed as to conceal the whole of the eye-ball, and to leave an aperture but just sufficient for the sight, a circumstance which gives to such individuals, as in the present, the appearance of having their eyes shut; this they probably are obliged to do, to protect them from the glare of sunshine. Should we add satirist or realist to the list of Burchell attributes? 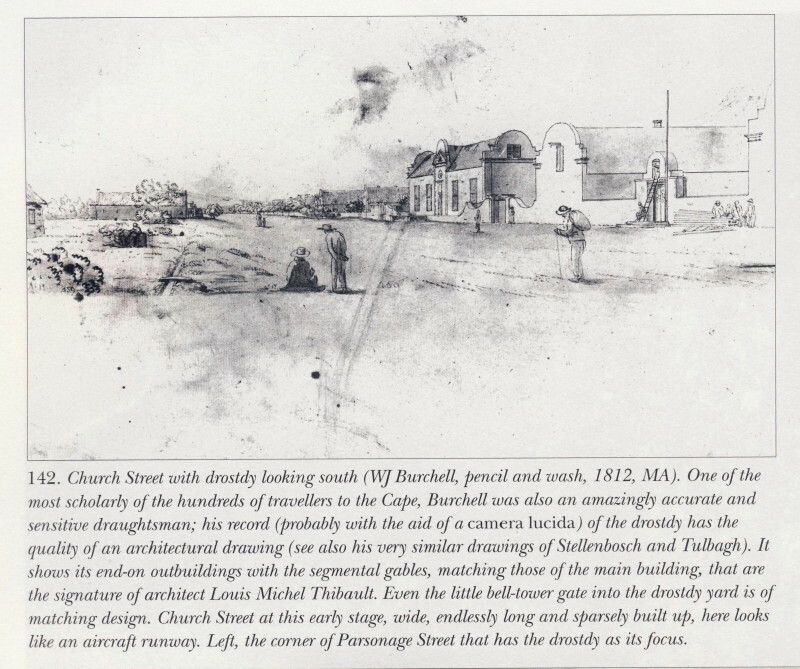 This painting of a San kraal comes from volume 2 when Burchell travelled down to Graaff-Reinet to recruit staff. It was north of where Britstown now is. I include Burchell’s commentary on the picture (2:198). * The huts represented in this plate, are constructed of mats (Vol. I. p. 114. 263.) made of rushes, in the manner shown in a former plate (pl. 7. Vol. I. p. 325.) and more particularly described in a preceding part of this volume. (p. 55. and 56.) The Bushmen of the Cisgariepine most commonly paint their mats lengthwise with stripes of red-ochre. The outermost figure on the left, will give an idea of the appearance of a Bushman as he is usually equipped for travelling, having his bow, quiver, hassagay and kirri. Before him is a representation of one of their dogs, (p. 56.) which are of a race perhaps peculiar to these tribes. Hassagays and sticks, when not in use, are most frequently stuck in the ground by the side of the hut. 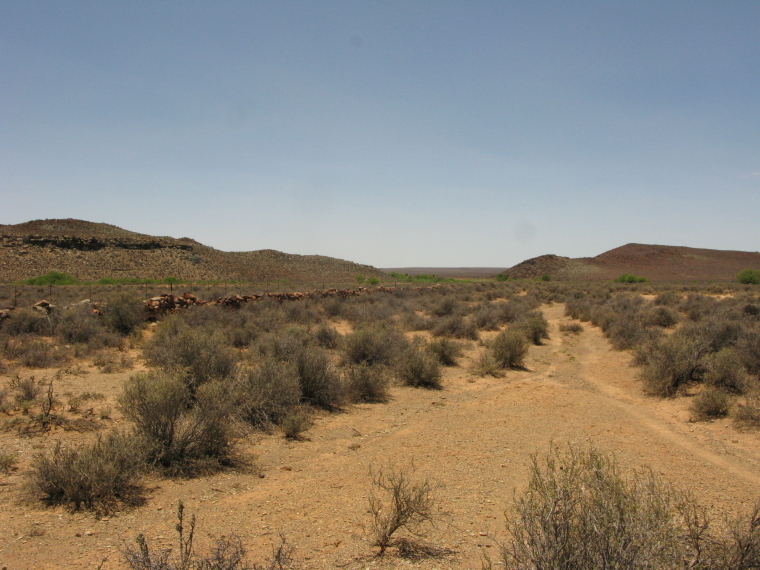 This plate exhibits, not only the particular view of the spot, but the ordinary appearance of a Bushman Kraal, and the genuine domestic state of its inhabitants, such as they are in their proper and original mode. In this picture, there¬fore, the number of figures and their occupations, are only those which are consistent with this intention, and have no reference to the unusual and busy scene which this kraal became in consequence of my arrival among these people. The nearest figure in the middle of the picture, is that of a man returning home from hunting, carrying a fawn or young antelope at his back. To the left of him, are two men, and a woman having her child in her arms, sitting in front of their hut, a very common manner of spending their time in fine weather: other parties of the same kind are seen at the other huts. Most of the figures have leathern caps of various forms according to the fancy of the maker or wearer. 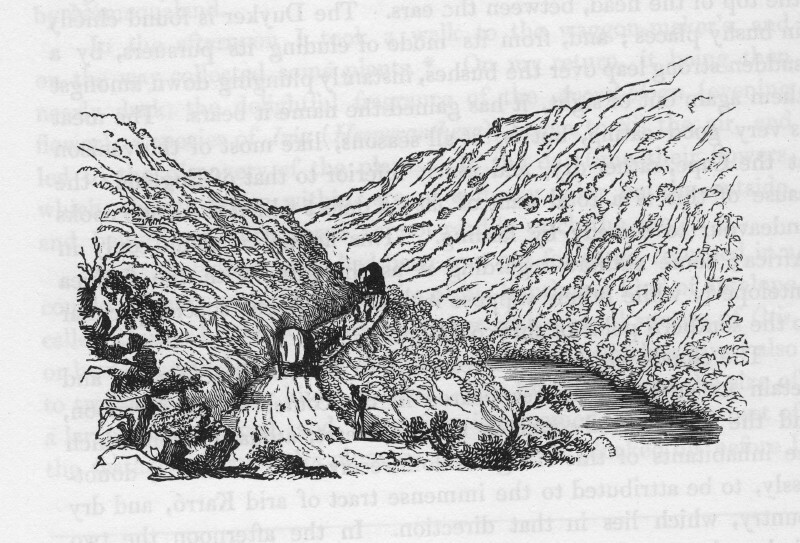 The outermost figure on the right is a man returning from the neighbouring spring with an ostrich-egg shell filled with water. On the left of him, and close to the hut in the fore¬ground, may be seen one of those sticks already described (p. 29.) as being loaded with a perforated globular stone for the purpose of digging up various eatable wild roots. 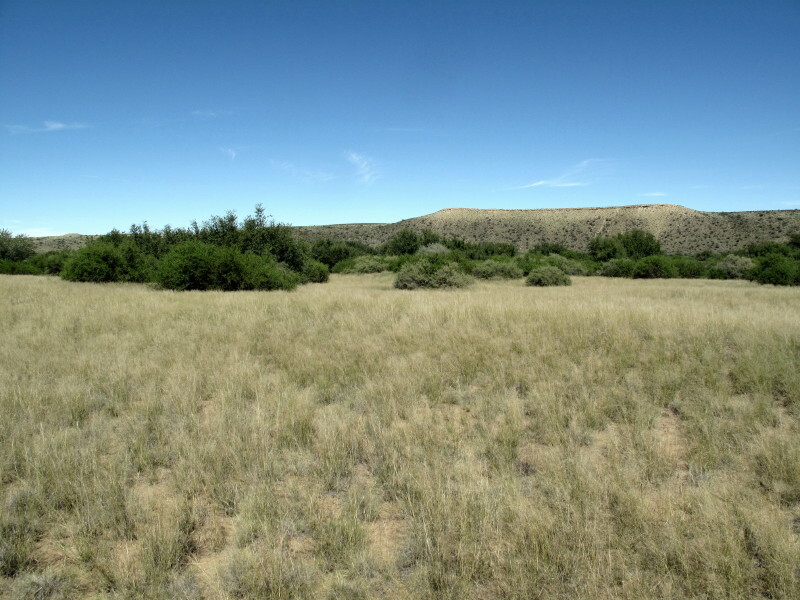 The soil here is of a reddish color, and scantily covered with herbage and low bushes. 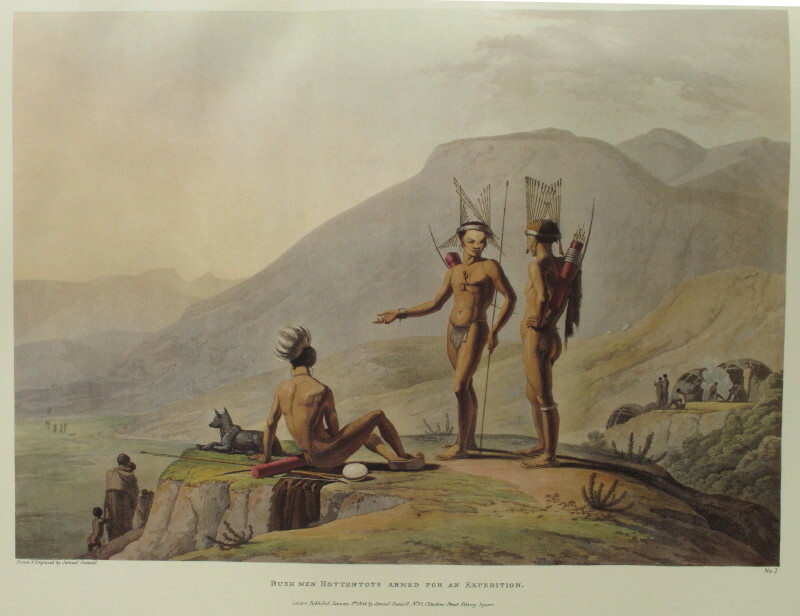 We will again come across San settlements and warriors in this report so I want to add the following two pictures for reference while I am busy with them. This picture is by Samuel Daniell (who I will introduce when we get to Litakun as his pictures of it were an important part of my quest). What looks like decorative headdresses worn by the men are actually their arrows. From Burchell’s commentary above it seems the quiver (koker) was only used when travelling though Daniell shows them doing both. 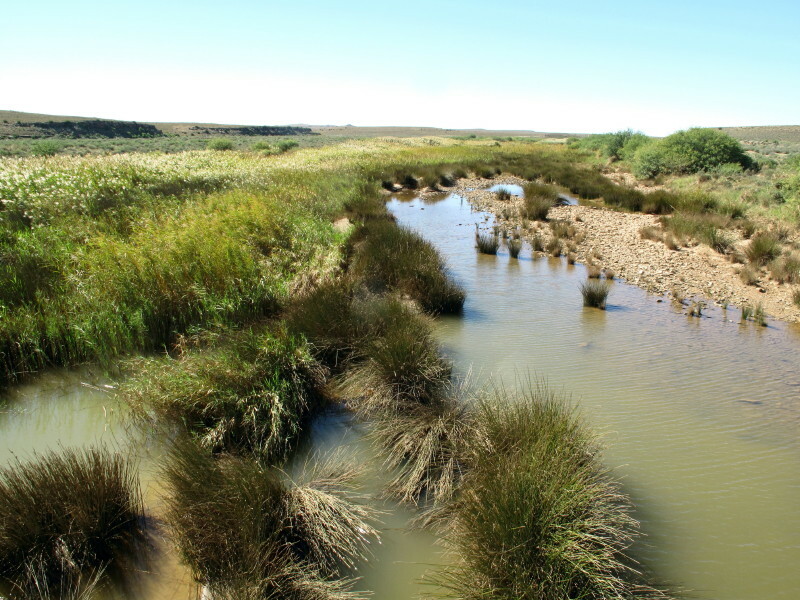 I went to the ‘township’ at Canarvon because it is called Skietfontein - Burchell mentions the good spring there. It is not worth showing a photo of it. 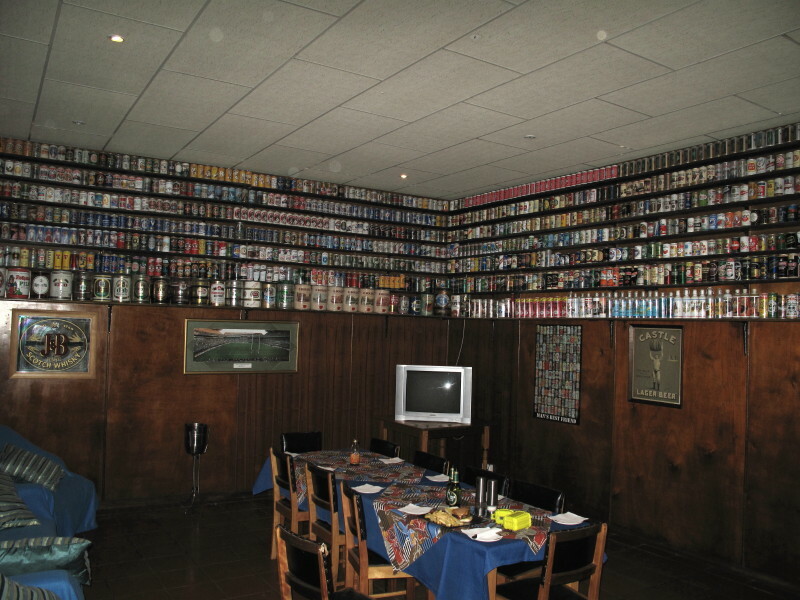 Blikkies bar in Canarvon for lunch is worth showing however. 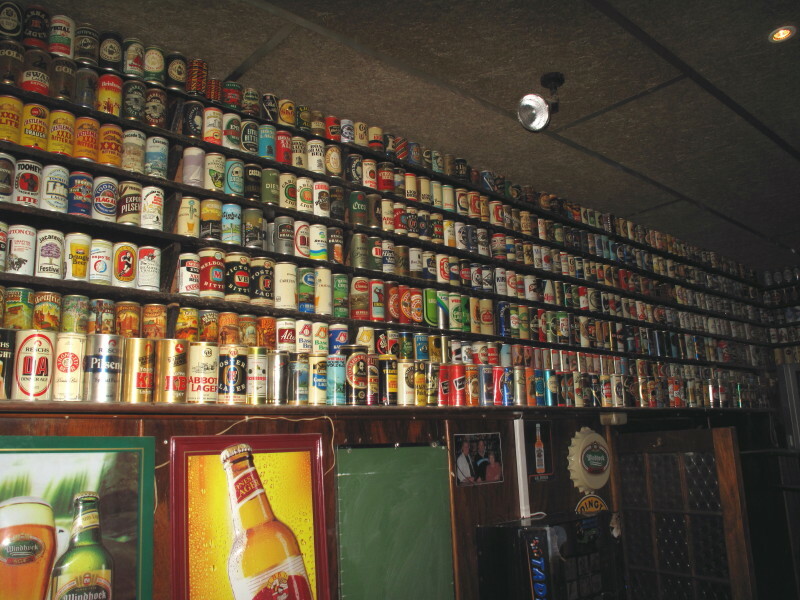 There are two rooms panelled in pristine beer cans. 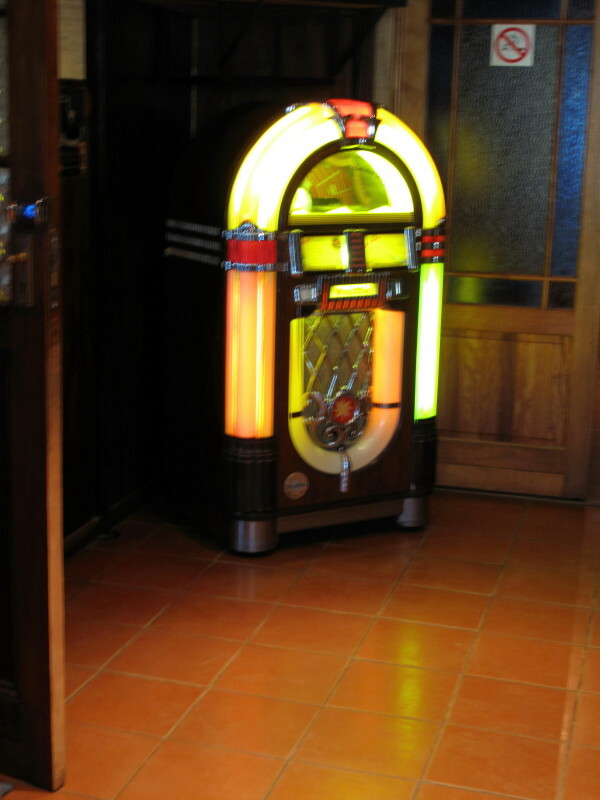 And a juke box that looks just like they did in my teenage years. I had the fortune to be exposed to an item of Afrikaans culture that I had seen derided on WD, someone played ‘Ek het ‘n tooter op my waterskooter’. Besides the lovely Kareeberg in the background note the following: Burchell had a specially small wagon but it took eight oxen to draw it. At the front one of his team is riding one of the spare oxen (rest out of the picture) – riding an ox was quite usual, even by young girls. At the front is the voorleir leading the oxen. Look how long the whip is so that the driver can crack it next to exactly the ox he wants to gee up. At the back is the flock of perambulating supper – only to be used when they failed to shoot their supper. Daylight the next morning brought to view a desolate, wild, and singular landscape. From our station on the top of a steep descent, the mountains of the Karreebergen (Dry Mountains) appeared before us. The only color we beheld was a sterile brown, softened into azure or purple in the distance: the eye sought in vain for some tint of verdure; nothing but rocks and stones lay scattered everywhere around. But that which rendered the view most remarkable, was the form of the mountains, presenting a multitude of flat, broad, level tops, and creating the idea of a congress of Table mountains. 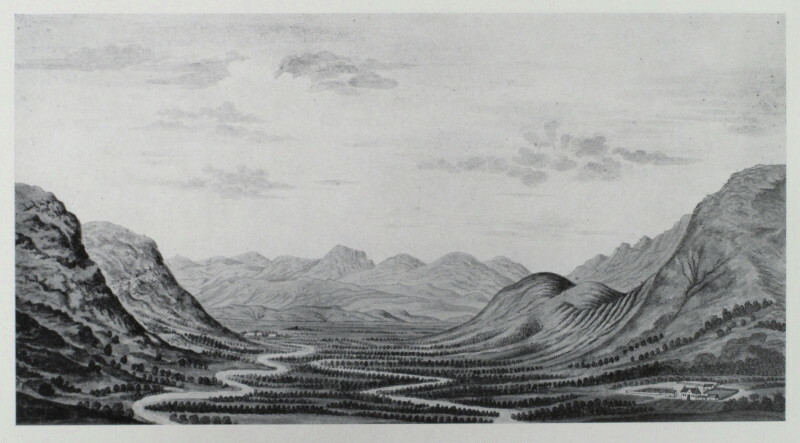 These were but a small part of the Karreebergen, a range which consists of an innumerable assemblage of mountains, all of this kind without exception, forming a belt across the country of from five to ten miles in breadth, and stretching out of sight on either hand, apparently in a north-westerly and south-easterly direction. Their extent is quite unknown, as they have never been traversed in any other part than that in which they were now crossed by us. I made a careful sketch of a portion of this view, including, in the foreground, a part of our caravan; the various groups of which always formed both picturesque and interesting objects. I want to go back there and ‘traverse’ the whole length of that ‘ congress of Table mountains’. They appeal to me just as much as they did to Burchell. 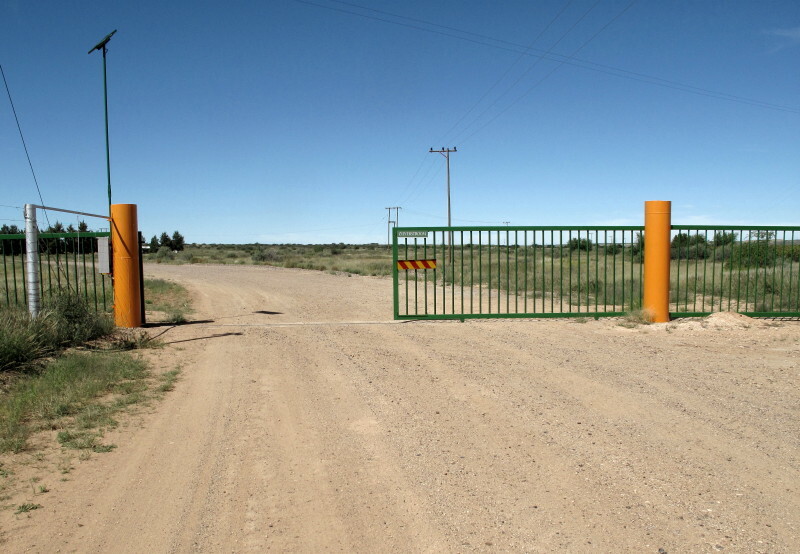 That is the poort through to Prieska which is why they had never ‘been traversed in any other part’. Part of the caravan going across the Karoo. Pretty much the same today. 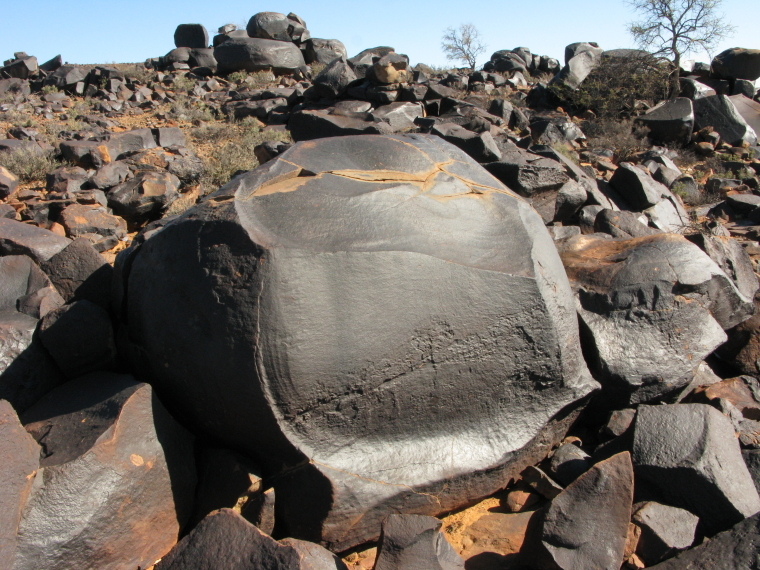 There are lots of pictures like this in this post – that’s what the Karoo is like and I want to convey what Burchell experienced. 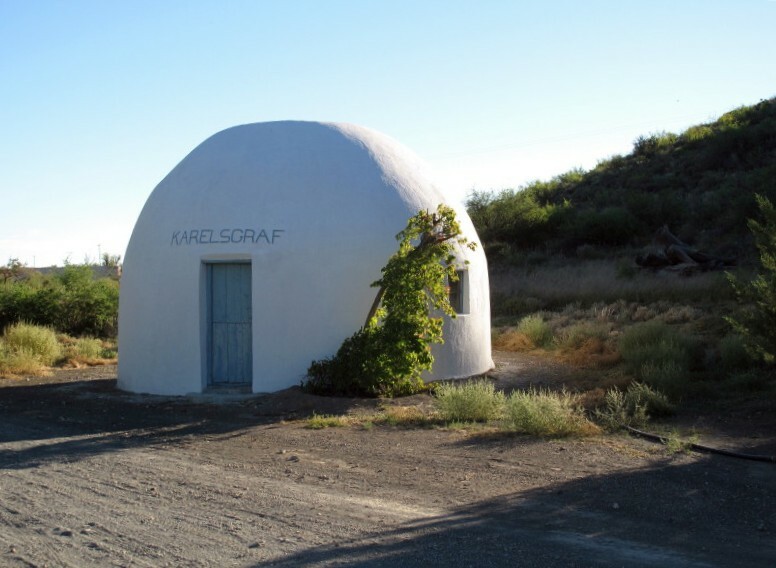 It took them 38 days travelling to get from Karoo Poort to the Gariep. Closer to Kareeberg. This looks similar to Lichtenstein's landscape. 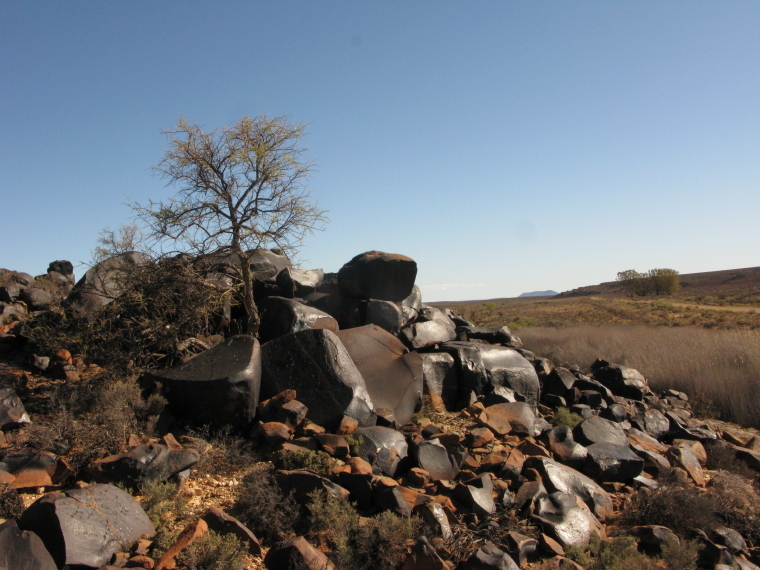 As we drove through the Kareeberg we saw these lovely Dolerite rocks. Closer picture showing the gorgeous fractured face. Some indication of how extreme the temperatures can be locally. We also saw these Karee trees that give the mountains their name. Burchell says the name karee means dry. Modern dictionaries say the word is of khoikhoi extraction. Two days after posting that edit I was looking at the South Africa Road Atlas issued by Engen but produced by map Studio. I noticed that they mark the Kareeberg as being between Canarvon and Prieska = to the east of Canarvon. It is shown as being to the south of the Canarvon/Prieska road. On the government 1:250 000 map that same mountain is labelled as the Grasberg while the Kareeberg is shown to the north of the Williston to Canarvon road so to the west of Canarvon. I checked through my pictures and found this picture taken after I had left Canarvon so it is of the Grasberg (Surveyor General’s name). This then fits in with Burchell’s picture. I had been expecting the scene before Canarvon. No doubt in Burchell’s day both mountains were called Kareeberg. The Grasberg match Burchell's drawing well. EXCEPT they are on the wrong side of the road! Burchell was travelling eastwards so a drawing showing his wagon travelling left to right has been made looking northwards. I remain puzzled. (The first picture showing the Doringberg is much closer to Prieska). As for Liechtenstein’s picture; I don’t know his route so either the picture I posted two days ago or this picture may be his scenes – though this one looks more likely. Some day I will explore the Grasberg. As we walked on, I enquired the story of Carel Krieger's fate. He was an indefatigable and fearless hunter; and, being also an excellent marksman, often ventured into the most dangerous situations. One day, near this spot, having with his party, pursued an elephant which he had wounded, the irritated animal suddenly turned round, and, singling out from the rest the person by whom he had been wounded, seized him with his trunk, and, lifting his wretched victim high in the air, dashed him with dreadful force to the ground. His companions, struck with horror, fled precipitately from the fatal scene, unable to turn their eyes to behold the rest of the tragedy. But on the following day they repaired to the spot, where they collected the few bones that could be found, and buried them near the spring. The enraged animal had not only trampled his body literally to pieces, but could not feel its vengeance satisfied till it had pounded the very flesh into the dust, so that nothing of this unfortunate man remained, excepting a few of the larger bones. Such is the sad story, as it was related to me on the spot where it happened. Since there is a spring there now there is a farmstead called Karelsgraf. It includes this corbelled building with the name on it (it is not the actual grave – he died long before there was a farm here). Another corbelled building I saw. 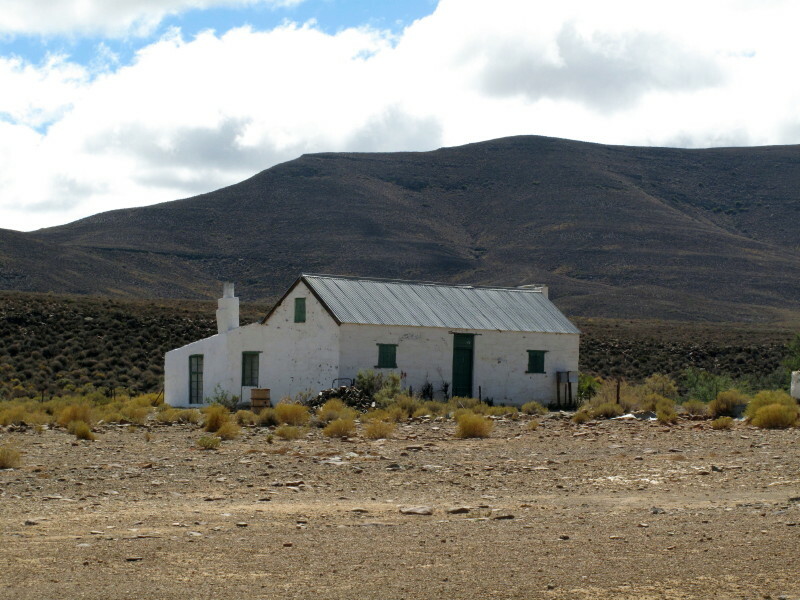 They seem to have been the original standard building of the boers who settled the Great Karoo. * corbelled buildings here *. This is the main road of Prieska. 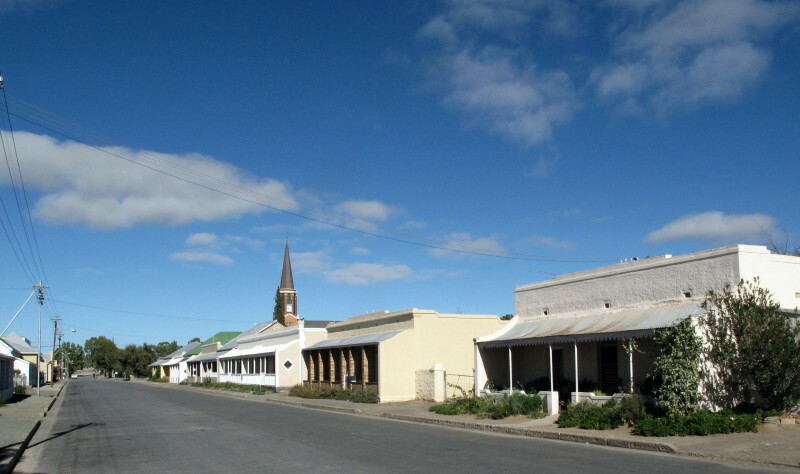 The classic Karoo town layout; church at the head of the main street. Note the onion dome on the steeple – could be in Moscow. Hooked. TT sent you a PM. I shall be quoting from William Dicey Borderline, Kwela Books, 2004. 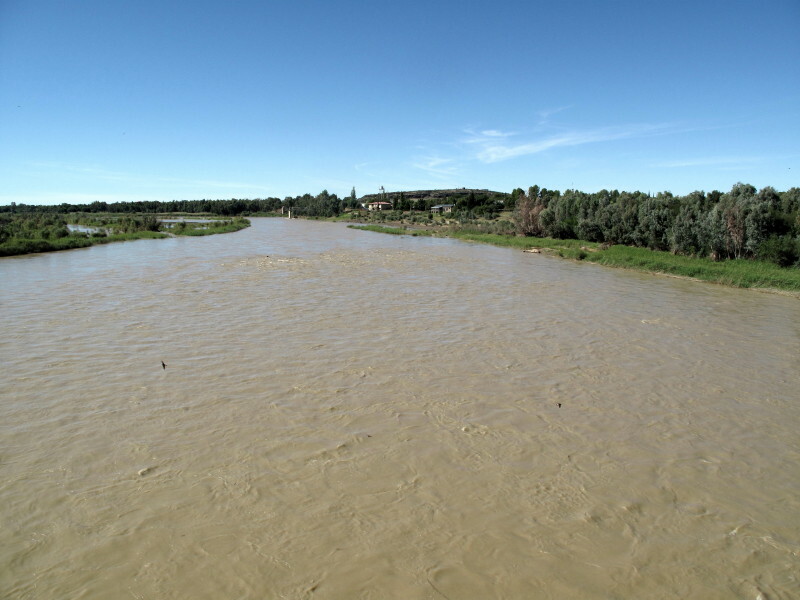 This town’s claim to fame is it is one of the places you can cross the Gariep river but they absolutely ignore the river – the chief feature in the locality. Prieska is just behind the scrubby trees along the bank of the Gariep on the right of this picture. I found a little track to the riverside close to the bridge. I had to ride through an unofficial dumping site to get to the Gariep. There is Die Bos on the other side of town. It was a braai and relaxation area under the trees alongside the river. I went there to have a look but didn’t stop as some people are squatting there making me feel quite threatened. Imagine if there was an imaginative town council years ago that had decided to make something of the river frontage. If the main shopping street had been set some way back from the river so that there was a treed & grassed area all alongside the Gariep with benches and braai places as a community space alongside the main commercial centre with views of the river. There is a majestic and gorgeous river right there but they ignore it. I tried firstly from the south side where map #2922 & Mapsource show a very minor road but it was locked. I then went over to see if I could get to it from the northern side. I was very lucky to find the gates open to the big farming operation alongside the river (it was Sunday). I went round & round the side of interlinking pivot irrigation circles. I had the Zumo on a small scale but the sun showed which way to go & there was no one to chase me away. The irrigation stops short of the river (flooding?) so I had to walk the last bit to see what it looked like. The river is on the far side of the trees against the hillside.